Please leave your memories and stories in the LifeQs section of the site. The LifeStory page includes the obituary and many other lovely tributes. 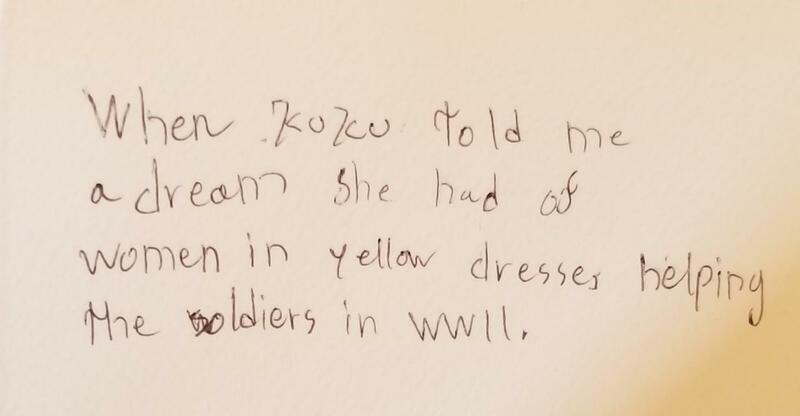 See the LifeTimeline for the full chronology of Kuku's extraordinary life. 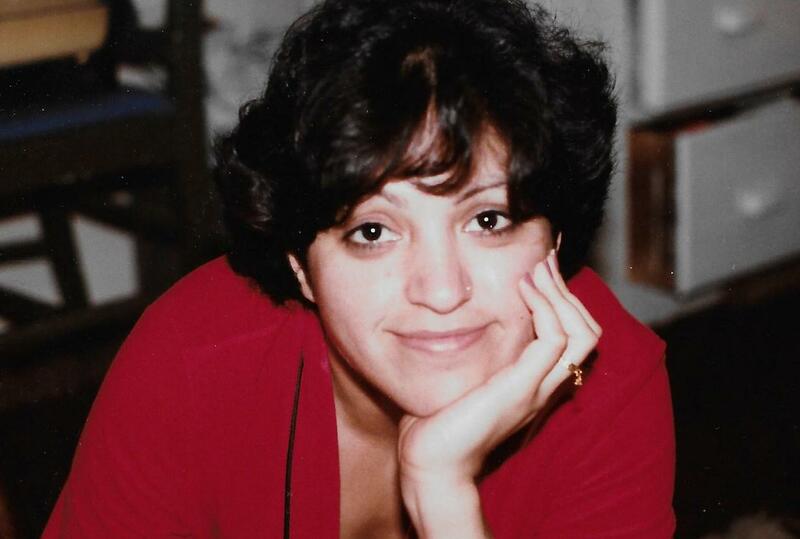 Kukula Kapoor Glastris, Books Editor of the Washington Monthly, died August 29 of Acute Respiratory Distress Syndrome, surrounded by family and friends. She was 59. 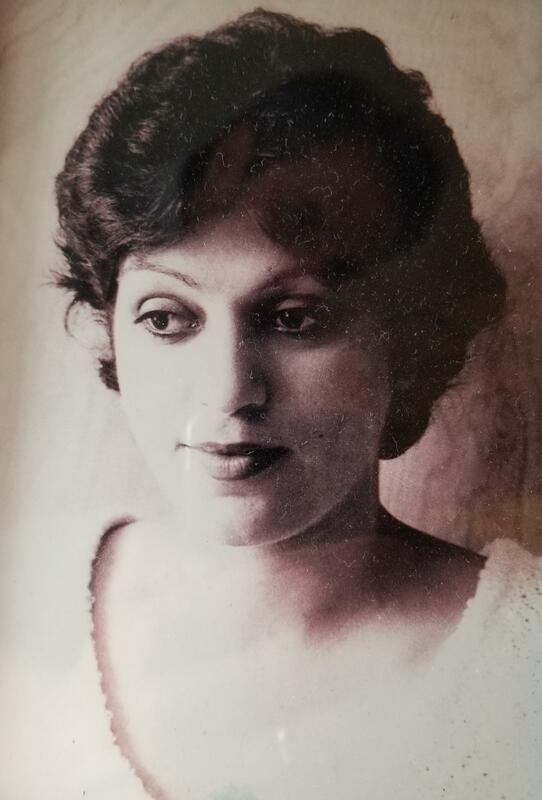 A keen editor and diplomatic manager of writers, she served as den mother and provisioner of delicious late-night home cooked meals to a generation of young Monthly journalists. “I’ve never met anyone whose combination of personal goodness, plus intellectual and professional abilities, exceeded Kukula’s,” journalist James Fallows wrote at The Atlantic. She was previously Associate Producer for Irv Kupcinet’s talk show in Chicago, a staffer at Ralph Nader’s Center for the Study of Responsive Law in Washington, and a reporter in the Chicago bureau of US News & World Report. 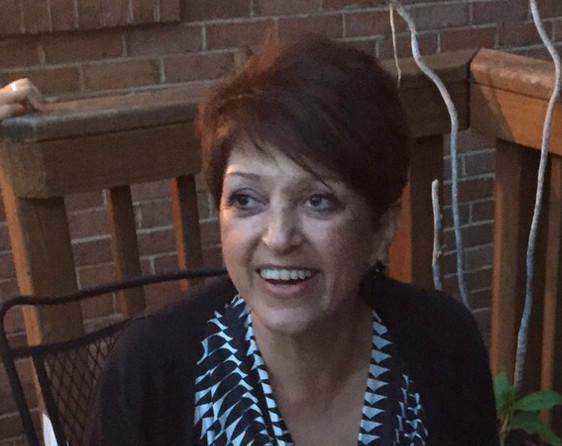 Married 31 years to her life partner and best friend, Paul Glastris, Editor in Chief of the Washington Monthly, she viewed her children, Hope Sudarshan and Adam Singh, as her greatest accomplishments. Born in Tibet, she was the daughter of Indian diplomat Randhir Singh Kapoor and businesswoman Raj Kapoor of New Delhi. She spent her childhood in India, Senegal, Syria, Germany and Switzerland, before moving to Bloomington, Indiana to attend Indiana University, where her aunt and “maasi,” Sudarshan Singh, and uncle, Dr. Paul Singh, were on the faculty. In addition to her husband and children, she is survived by her sister Suman Kapoor and brother Sanjay Kapoor. Episcopal Church of the Redeemer, Bethesda, Md. 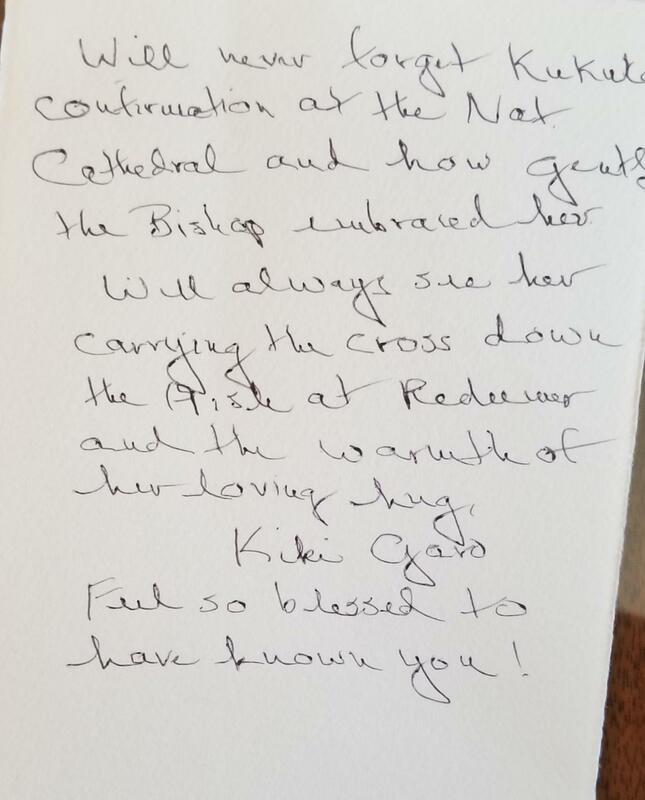 Over the last eight harrowing and heartbreaking weeks, one of the things that has most sustained my family and me has been the steady stream of supportive phone calls, emails, and comments on Facebook and Caringbridge from so many of you—Kuku's friends, neighbors, colleagues, and parishioners here at the Church of the Redeemer. I cannot emphasize enough how important those messages were to our spirits, or how consistent they were in what they expressed. 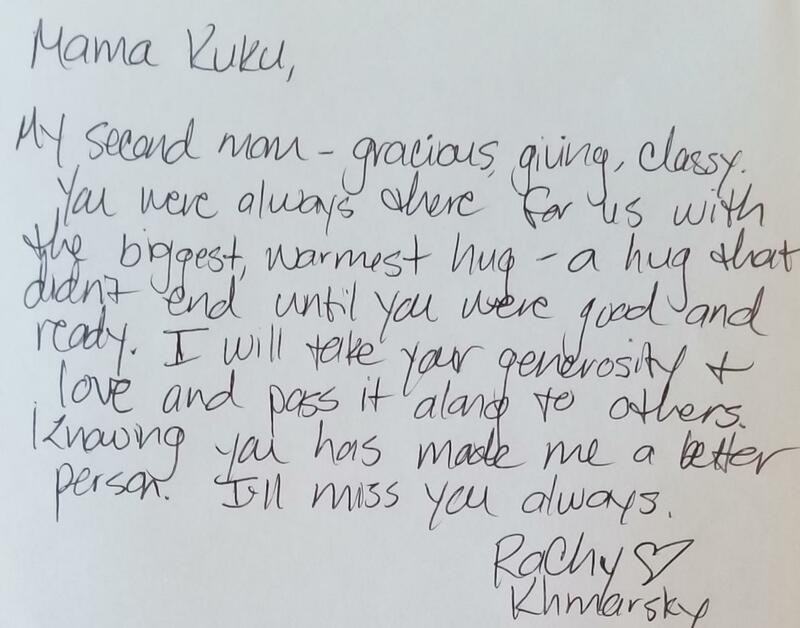 Almost without fail, you talked about Kuku's relentless kindness, the generosity and love that seemed to radiate from her like the heat and light of the sun. And time and time again, you asked us what you could do for us: Can we run some errands, put up a houseguest, take the kids out for a movie, bring you over some food? 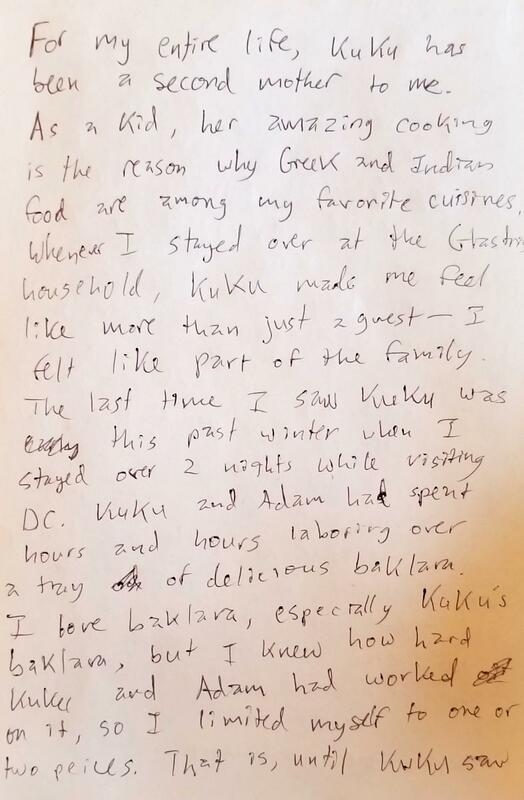 Of course you were right about Kuku's radiant generosity. But in your offers of service, you also mirrored something that was at the core of her being. We all know this about Kuku. She is the woman who came to church but could not just sit in the pew. She wanted to be offering the Eucharist on the altar, carrying the Crucifix down the aisle, serving coffee downstairs after the service, and cleaning up the kitchen afterwards—having, of course, arranged the flowers the night before. At work she not only brilliantly edited book reviews but brought in pots of home-cooked food for the staff during late-night closings. At home she would make sure our dinner guests had already started eating before she sat down at the table, and she would snap, "Don't you dare!" if you tried to carry your empty plate to the sink. 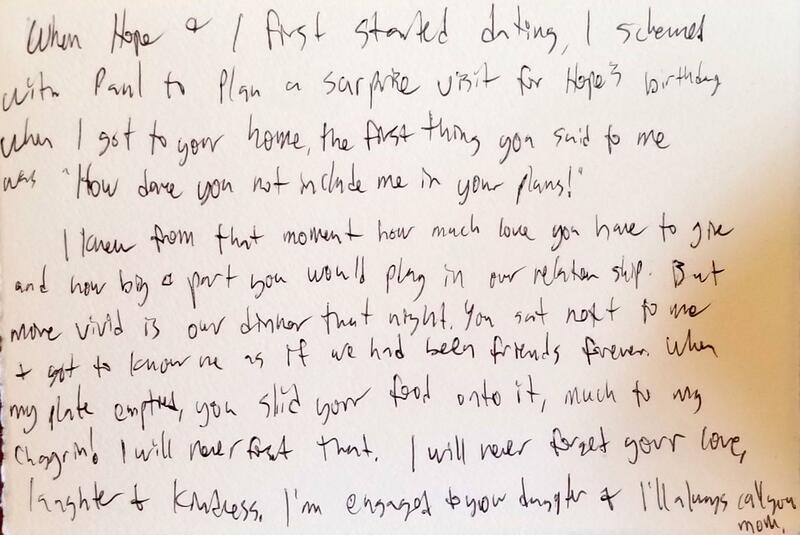 Yet if you invited her to your house for dinner, she would insist on doing the dishes, and no amount of argument would dissuade her. 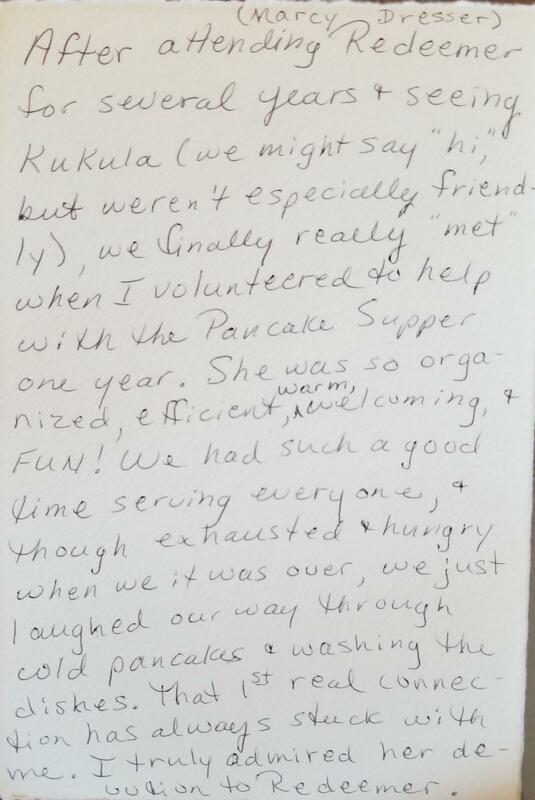 Serving others made her happy. Of course, serving her family made her the happiest of all. 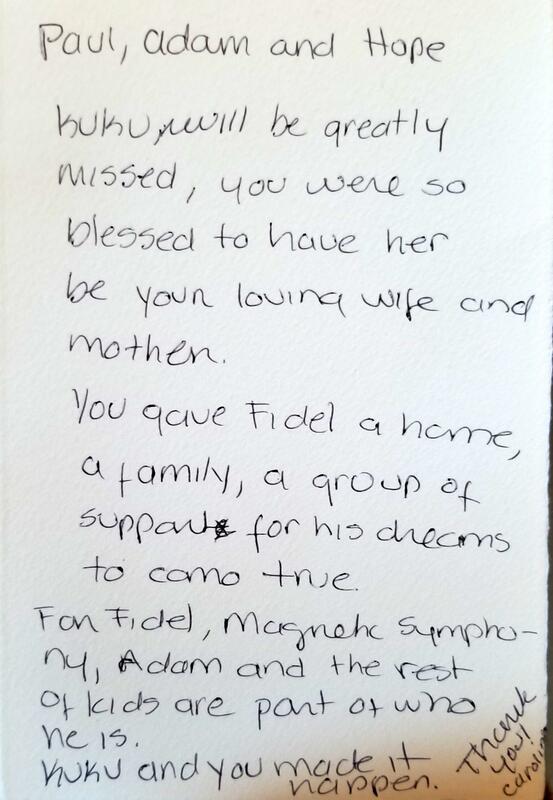 She was a spectacular mother to our two children, Hope and Adam, and engendered in them the same generosity of spirit. The grace and strength they have shown over the past two months was a direct reflection of their mother’s love and character, and I am proud of them beyond words. But as many of our kids’ friends will tell you, Kuku was also a kind of second mother to them, her home a place where they could come after school or work or at any other hour of the day or night and be hugged and kissed and given a plate of delicious food that she seemed always to have at the ready. Her web of generosity and kindness and devotion spread much further than that. 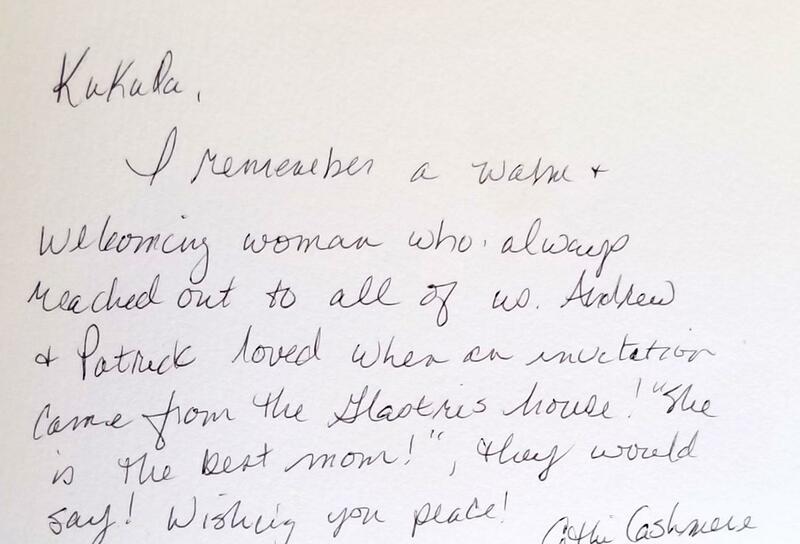 It included both of our extended families—her sister and brother, my brothers and parents, our cousins, nieces, nephews, aunts, uncles, and the scores of my parents’ Greek American friends in St. Louis, whose wedding shower gifts to her she still remembered thirty years later. 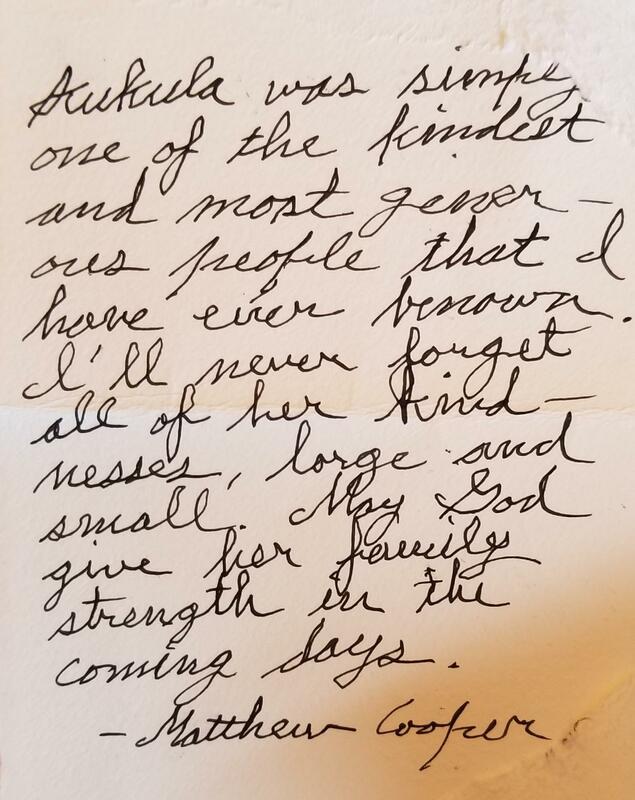 It extended to everyone she interacted with regularly: the butcher at the Giant, the ladies who washed her hair at the salon, the writers she communicated with only through emails but whose kids' names she had somehow learned and would ask them about. She had, frankly, the skills—though not the ego—of a politician. This she came by honestly. Her grandfather was a senior provincial official in the British Raj; her father was one of the Indian diplomats who helped the Dalai Lama escape Tibet and then escaped himself with his family, including two-year-old Kuku, on pony-back over the Himalayas; her mother was a talented diplomatic hostess, a pioneering entrepreneur, and a force of nature. From them she inherited an unquenchable passion for politics and foreign affairs and an unyielding belief in the promise of democracy. Politically, she was a liberal, through and through. To her, the liberal philosophy of inclusiveness, of caring for others, especially those who were marginalized and in need, of diverse peoples and faiths being all in this together, was a direct extension of her own humanity. She didn't just vote as a liberal, she lived as a liberal. Long before she immigrated to the United States, at seventeen, she revered John F. Kennedy and Franklin Roosevelt. Like many immigrants, she loved America more than do many native-born Americans. This same passionate inclusiveness defined her spiritual life. Her family's tradition was to embrace the faiths of their friends and neighbors, whether Muslim, Hindu, Sikh, or Christian. She could comfortably pray in any house of worship, though she chose Jesus as her guru. Marrying her was the most transformative event in my life, for it meant not only marrying a beautiful and big-hearted woman, but also marrying into a wonderful family and an extraordinary worldview, a worldview that was harmonious, inter-operable, of a piece. And over thirty-one years of marriage I accepted that worldview as my own. Morally, politically, spiritually, she set a high standard and compelled me to try to live up to that standard. She insisted that all of us who were close to her do the same. Things will go so much easier, she used to joke, if you just do as I say. With me, she didn't have to insist that hard, because when you are as crazy for someone as I was for Kuku you're going to do it of your own accord. In this way her generosity of spirit and loving actions created ripple effects, for she inspired others in her orbit to be and act like her. Losing our beloved Kuku is an unfathomable tragedy. 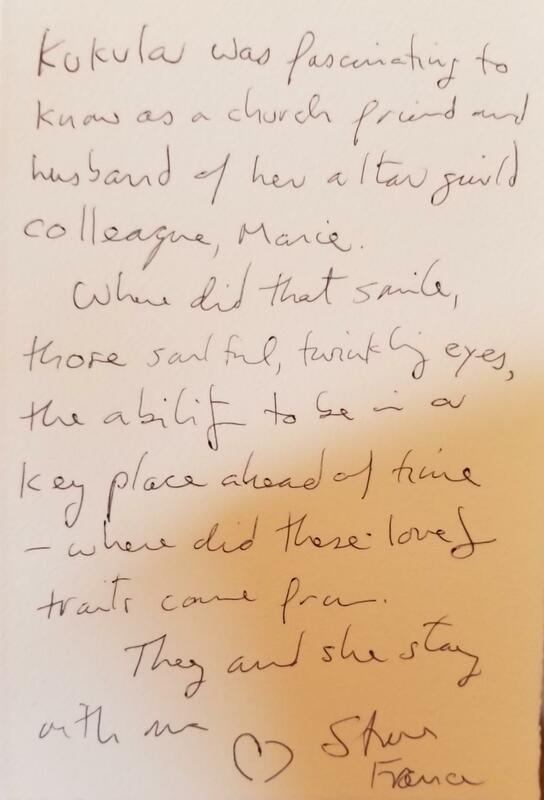 But because of her relentless generosity, she guaranteed that she will be here with us, palpably and insistently, always. We will think about the needs of others, not just ourselves, because Kuku insisted on it. We will fill other people’s plates with great food and their glasses with well-chosen—and moderately priced—wine, and then we will refill their plates and glasses, because Kuku insisted on it. 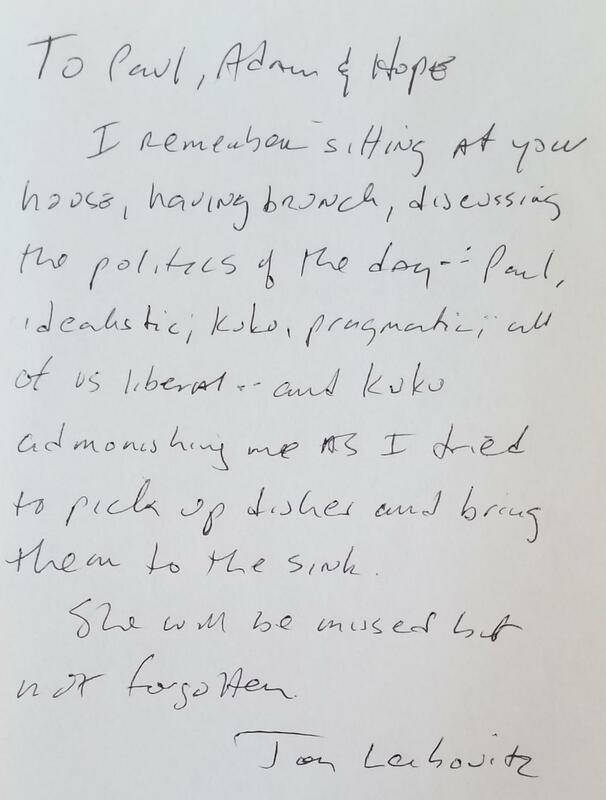 We will put our dishes in the dishwasher—not in the sink—because Kuku insisted on it. We will love and care for dogs and cats, especially the ones who need it most, because Kuku insisted on it. We will adore all babies and children, because Kuku insisted on it. We will read great literature because Kuku insisted on it. 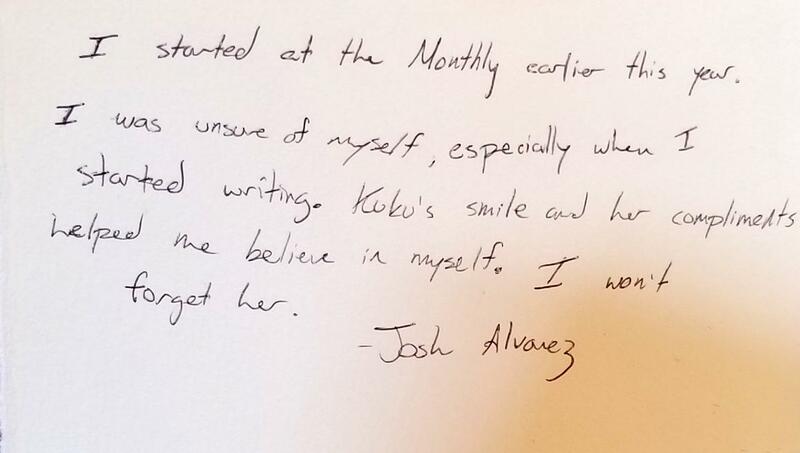 We will write prose that is clear, precise, elevated, and gracious, and ledes that are lively and witty, because Kuku insisted on it. We will demand that the elected officials we vote for be visionary but pragmatic, and that they give the opposition no quarter until they learn to behave, because Kuku insisted on it. We will worry about the future of the country we love, because Kuku insisted on it. We will push past pain and be cheerful, because Kuku insisted on it. We will call home when we get to our destination, because Kuku insisted on it. We will love each other—and Kuku—every minute of every day for the rest of our lives. 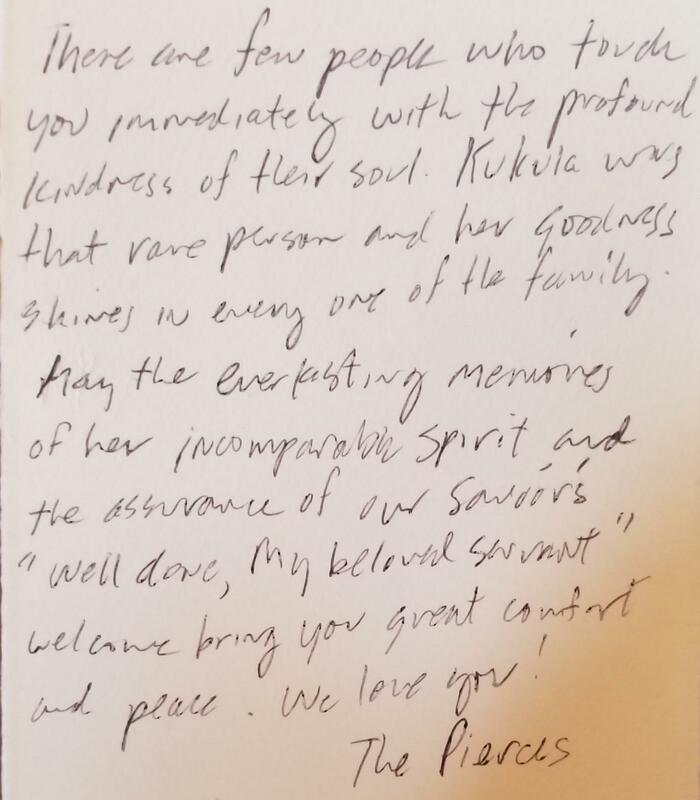 Many people who knew or worked with Kukula Glastris described her as “the kindest” or “the most generous” person they had known. It’s a big world, and titles like that can be contested. But I’ve never met anyone whose combination of personal goodness, plus intellectual and professional abilities, exceeded Kukula’s. The large number of people fortunate to have known her now offer support to her husband Paul, and their children Adam and Hope, at the heartbreaking news of her death. Early this summer she developed respiratory problems, which steadily worsened until she died last Tuesday night, at age 59. In the professional realm, Kukula became best-known for her work as book editor and very skilled story-magician at The Washington Monthly, the magazine of which her husband Paul became editor-in-chief and impresario, succeeding Charles Peters, more than 15 years ago. The psychology of editing requires a surface of encouragement/love/flattery — the ideal first words from any editor, to any writer, on first seeing any draft on any topic, are “Oh, this is going to be great! So wonderful! Now let’s just do this and this and...” — over a core of resolve. (“We’re not quite there yet, let’s look at this last section one more time...”) Kukula had both of these elements in abundance, along with the intellectual insight to know how a changed phrase, or a cut, or an addition, or an allusion could make the story stronger. 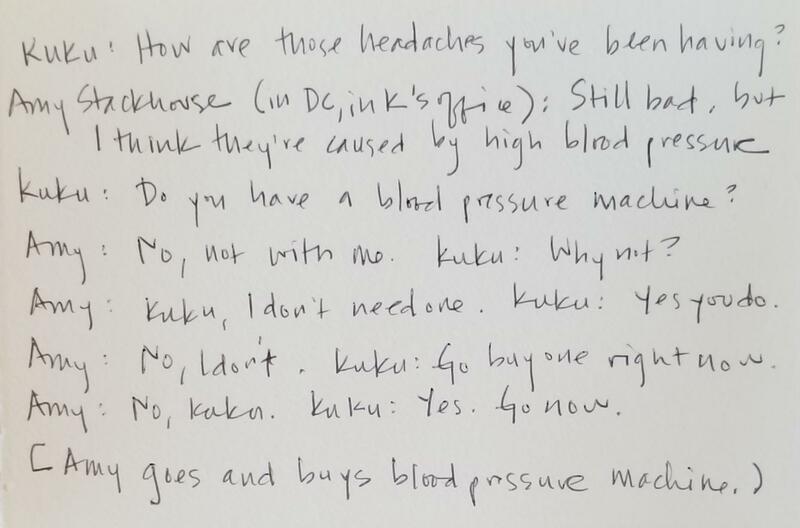 One of the Monthly’s very strongest recent pieces was “The Best Health Care Money Can’t Buy,” a harrowing but revelatory narrative by Samuel Jay Keyser, a linguistics professor at MIT, about how Veteran’s Administration medical care literally saved his life. 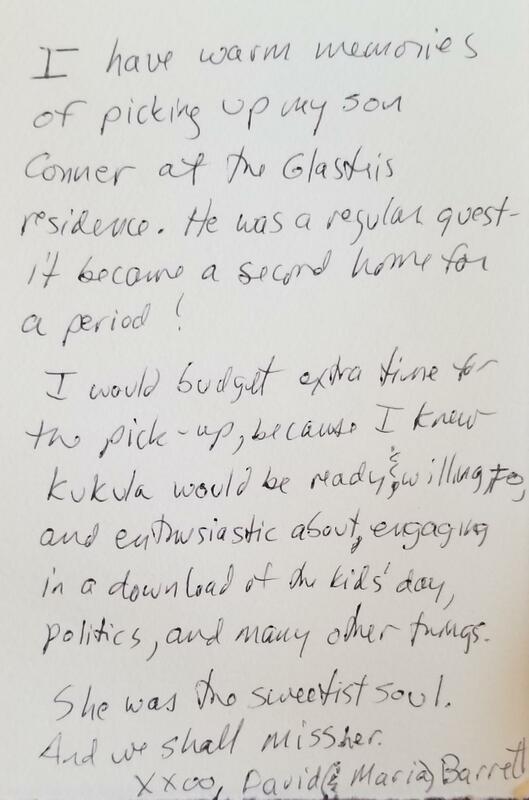 When I mentioned via Twitter how much I admired the piece, Paul Glastris immediately sent me an email: “Jim, you probably didn't know this, but Kuku was the one who edited the story! 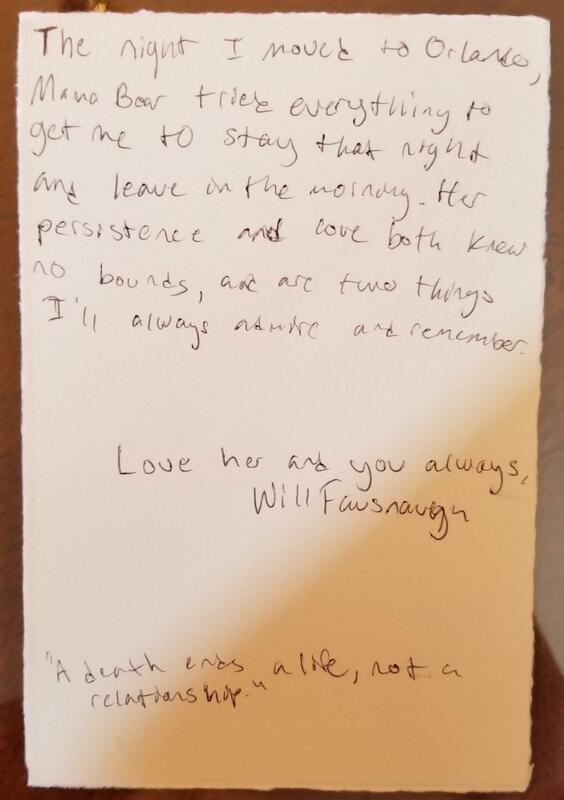 One of the many things I can't wait to tell her when she wakes up.” The last was a reference to her already being under sedation as doctors struggled to find out what exactly was wrong with her lungs. 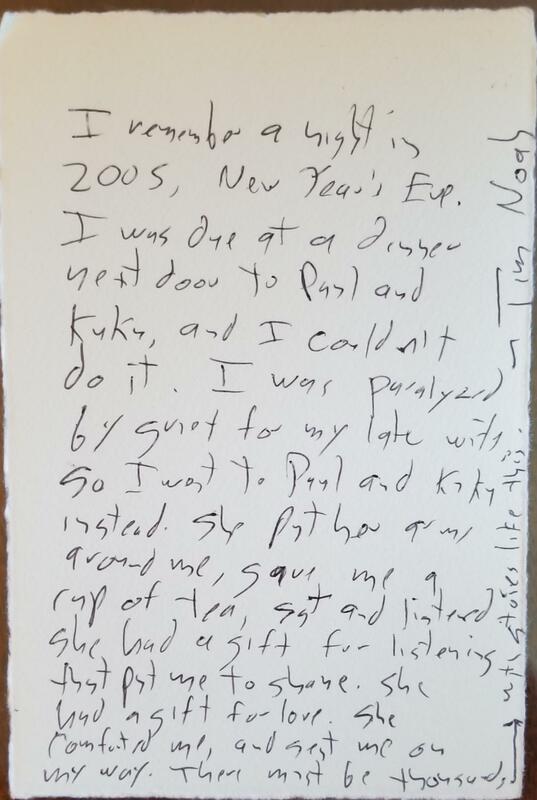 Paul’s note also suggested something about the relationship between the two of them. 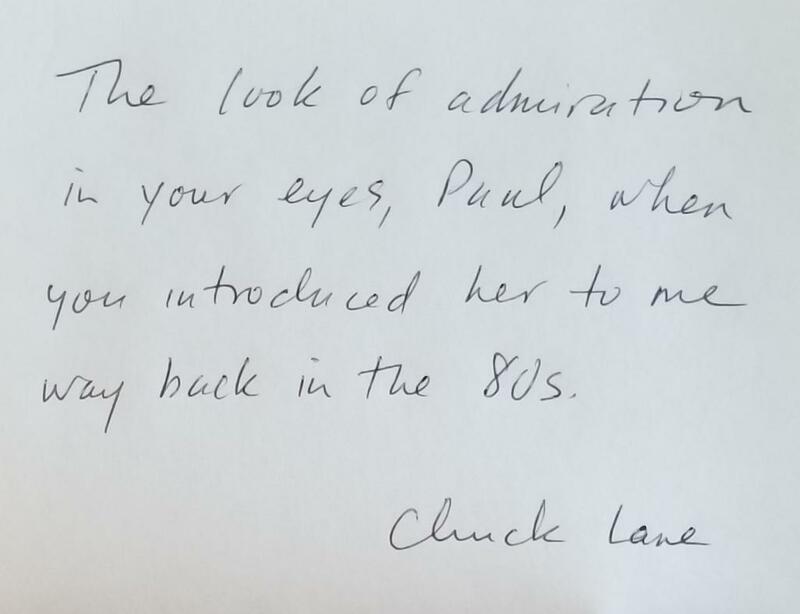 Like a large number of people in today’s political-journalism world, Paul had gotten his early training in writing-and-editing at the magazine he now edits, The Washington Monthly, under Peters, its legendary founder. (This year Peters published, at age 90, his latest and excellent book, We Do Our Part.) I had worked at the Monthly several years before Paul and have considered him a colleague and good friend for decades. He is a talented reporter and editor and entrepreneur and writer. (Before taking over the Monthly, he spent time as Bill Clinton’s chief White House speechwriter.) But he is also a tremendously big-hearted, buoyant, cheerfully tough person. Whatever is the Greek counterpart for mensch would apply perfectly to Paul (who is almost comically proud of his Greek heritage)—and, with further gender and nationality adjustments, to Kukula as well. The two of them had a tremendous amount of joy together, and brought joy to others, including through their response to a range of difficulties they faced separately and as a couple, with a jauntiness that set a standard for all around them. 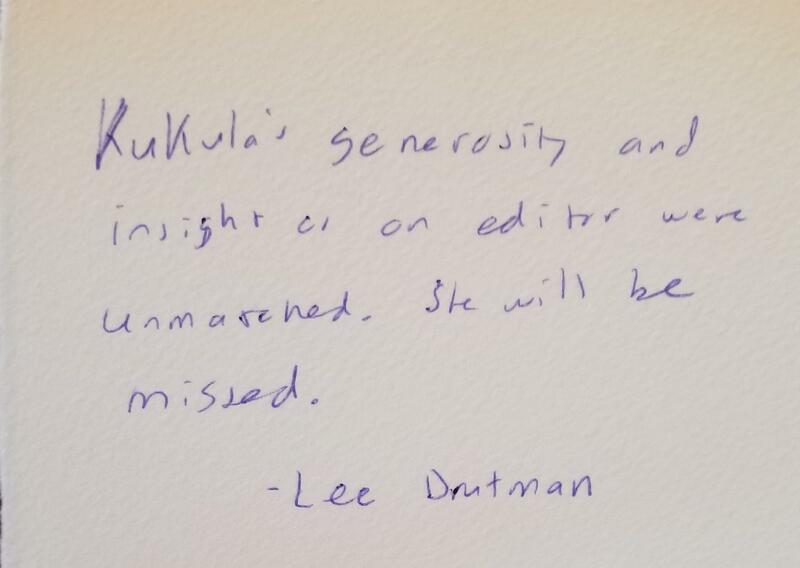 Beyond her professional work, and among people who had no idea about her editorial skills, Kukula left a huge and positive impression through her generosity, love, and humor. You can get some idea of what she meant to her varied communities through messages at this LifePosts site. 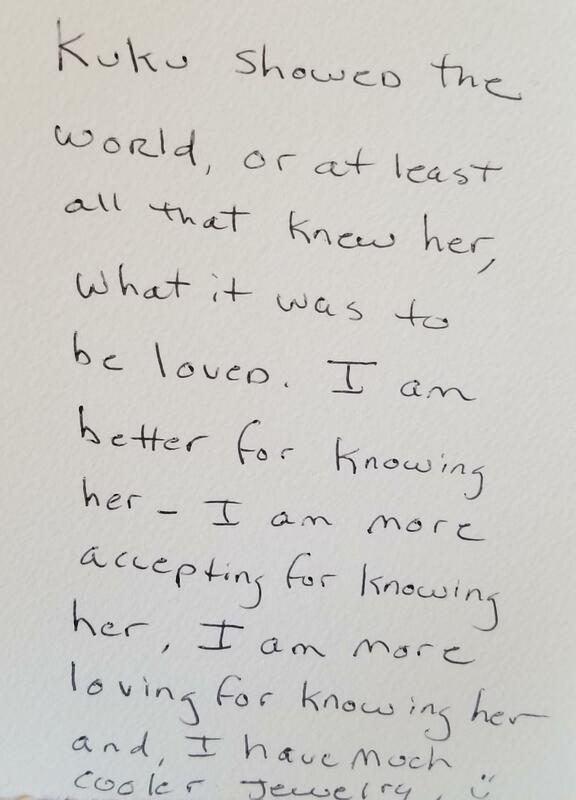 Those who knew her are the better for her presence in our lives. Paul, Adam, Hope, and their extended family are grieving now but will always carry her influence and example with them. Sincere sympathies to them, and thanks for sharing Kukula. The word “koukla” is a term of endearment, which in Greek means “doll,” or “baby doll.” It is typically reserved for babies or young girls, but can be used with older girls and grown women, as well. While it oftentimes suggests cuteness, adorability and beauty, there is something much more profoundly revealing in its usage. On a spiritual level, it suggests INNOCENCE. Why do humans universally smile when they gaze into the face of a baby? It’s because we instinctively resonate with their INNOCENCE, i.e., total absence of guilt or ego-identification. They have no developed ego, hence, no MASK, no projected false self, or persona, to propagandize, promote, or defend. They live in the present, unfettered by past guilt or future worry. They simply ARE, and most clearly and transparently reflect the Divine image within. They have no MASK to block the radiant light of their inner Icon. Kukula lived her life from this unified field beneath all of life’s contradictions, divisions and separations, embracing all thingsEast and West, North and South. In addition to light, this unified field can be defined as our complex and inexplicable caring for each other, or what our Buddhist brothers and sisters call the Great Compassion, without which there is no healing to life’s inconsistencies and contradictions. Saint Paul would call the unified field the love that: “…bears all things, believes all things, hopes all things, endures all things” 1 Corinthians 13:7. Mature spirituality is about getting you back and down into this unified field. 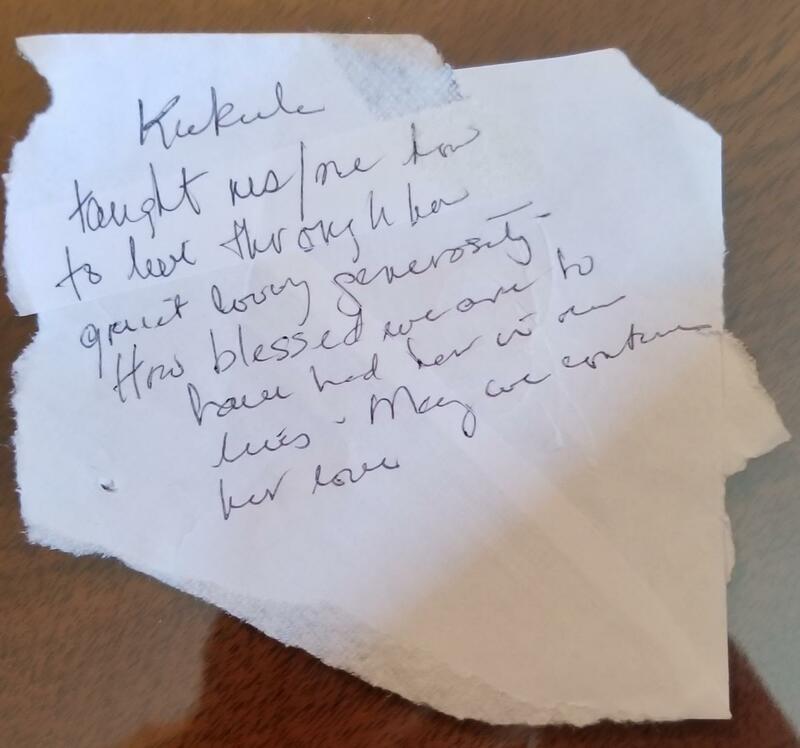 Kukula, “The Koukla of God,” Glastris, having never left it, lived her entire life from it, and in her limitless compassionate love, irradiated the rest of us in its healing light. May her memory be eternal. Amen. 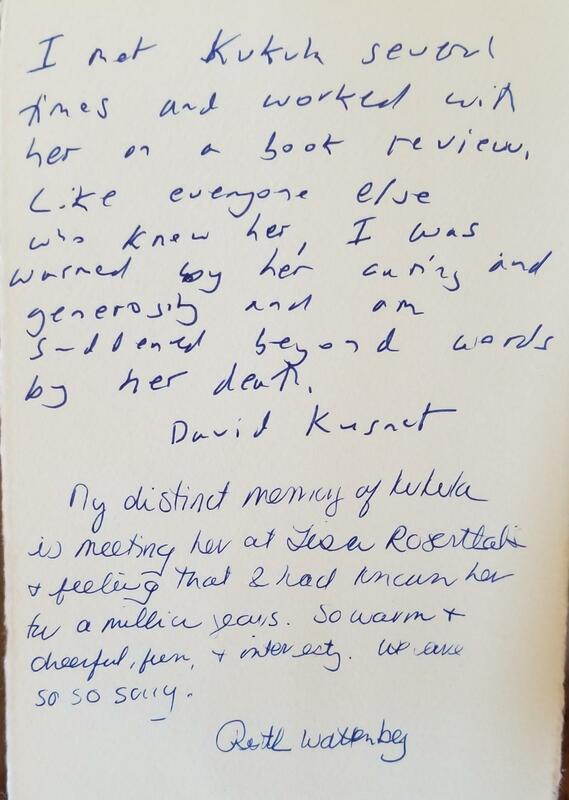 October 2018, From Jessica P.
I don’t think you will remember me – you would have no reason to, as we never met in person, but I did meet with Kukula regularly – twice a year, like clockwork, for the decade I was at Princeton University Press. I recently learned of her passing and though I know I am a year late, I wanted to share my condolences with you and your family. 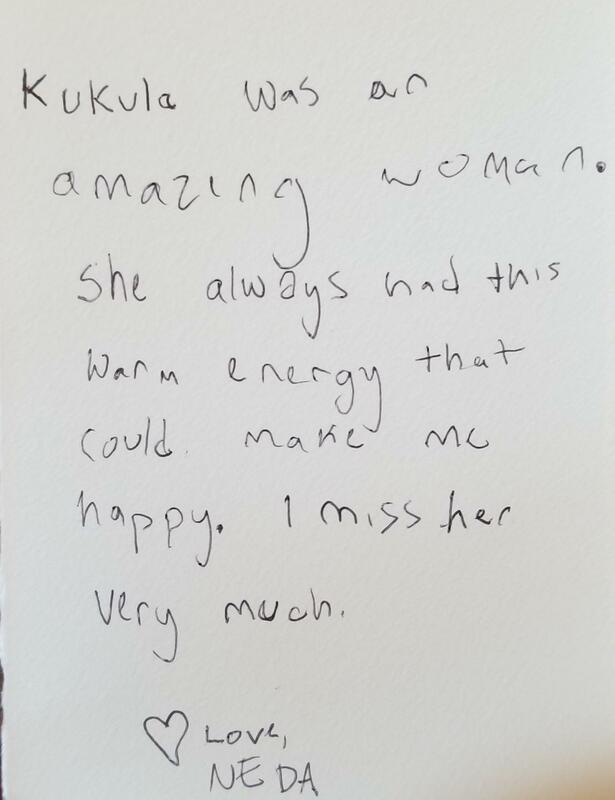 Kukula and I had so much more than a professional relationship. Our meetings were easily 75% chatting about our children and lives, 25% looking at books (I feel I can confess this now). 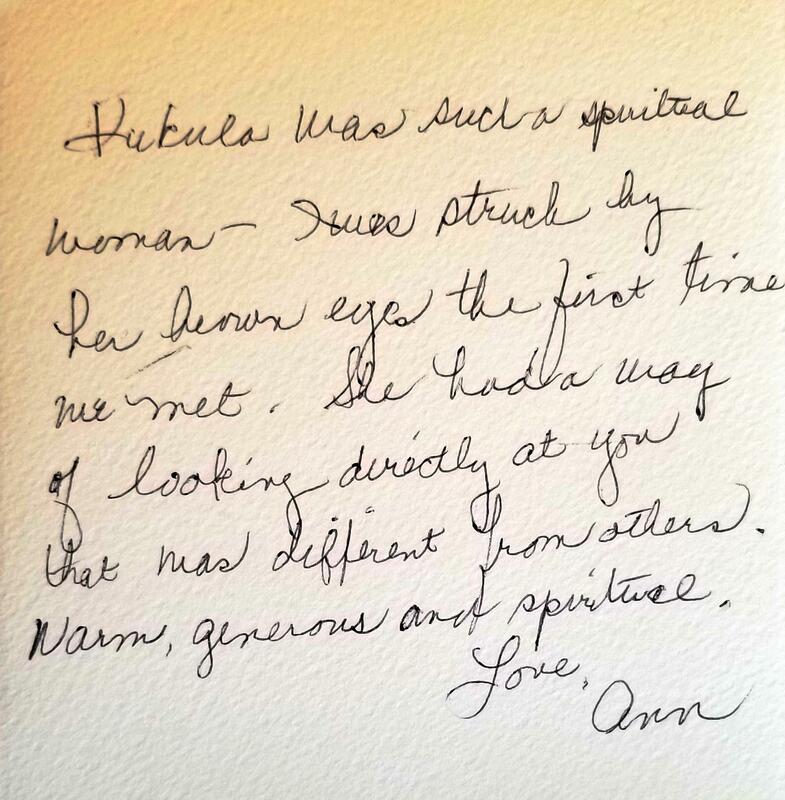 She was impossibly kind to me and set the standard for how a person should treat others – I always booked my appointment with her first for my trip and first thing in my day because it started everything right. I’d have a morning hug, a chat with a dear friend over coffee, and, of course, a stimulating intellectual discussion that would provide a spark for the rest of my meetings. 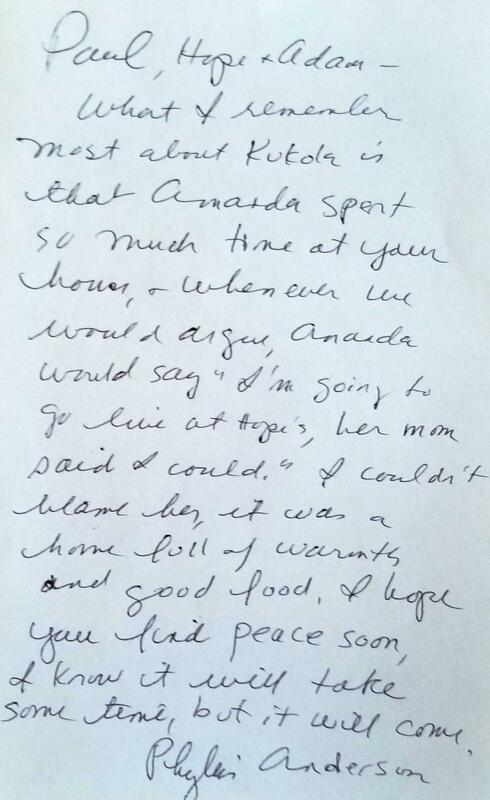 We bonded over our children.. She was one of the first people, outside of my family, who I told about my son’s diagnosis with ADHD in third grade. We shared our concerns over uncertain futures and the heartbreaks and joys children carry for their parents. 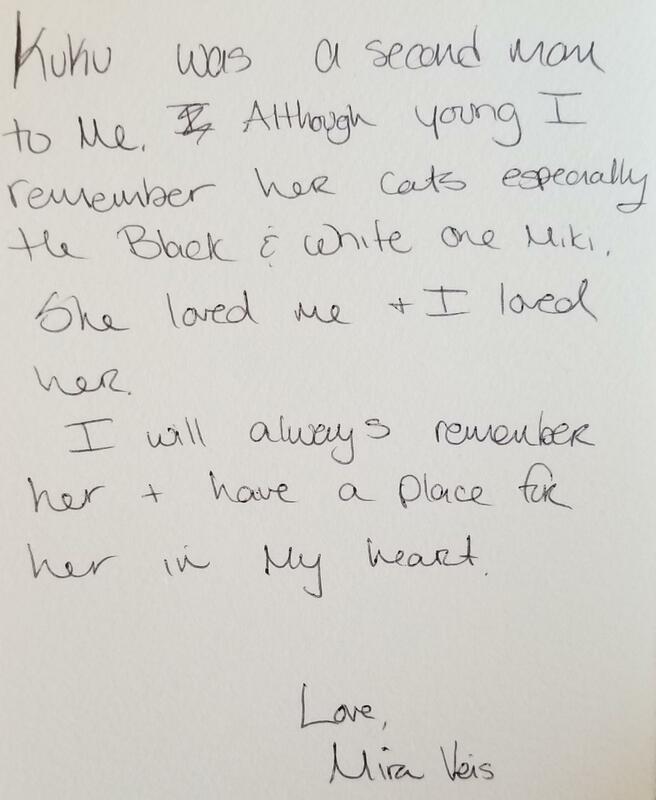 She helped me so so so much to understand there _was_ a future for my son. Now Ryan is 15 and he just took the PSATs. Even if his plan is different than what I expected, he has one (which would not surprise Kukula!). 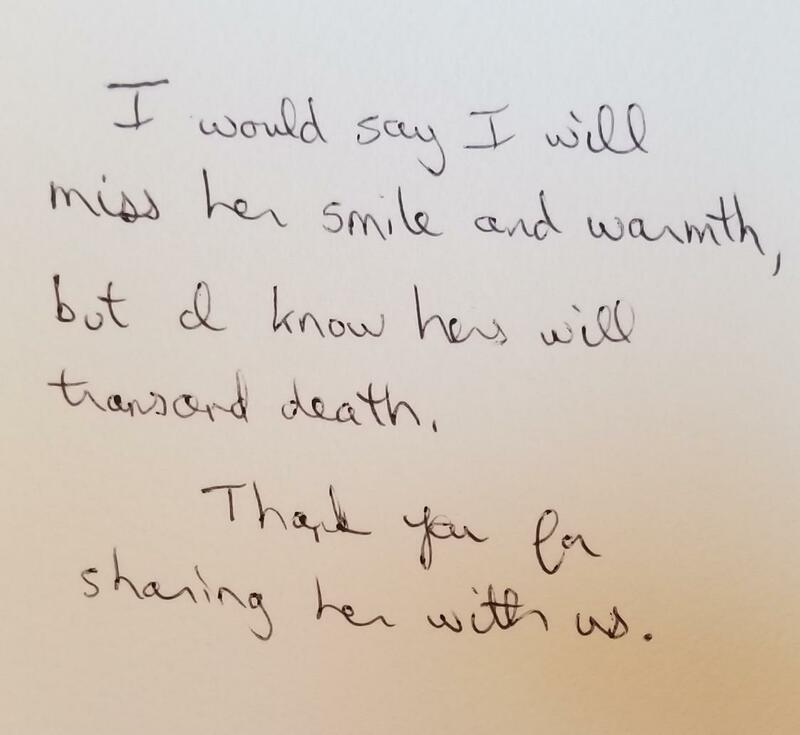 I would love to be able to tell her that he’s doing OK. I would love to share photos of my beautiful and brilliant daughters with her. I can’t believe I won’t have this opportunity. I am so sorry I allowed my change in career to intervene in our friendship. That because I no longer had a catalog to share or a trip to Washington in the works that I didn’t keep our conversation going in a different way. I am devastated to learn that I am too late to reignite our relationship. 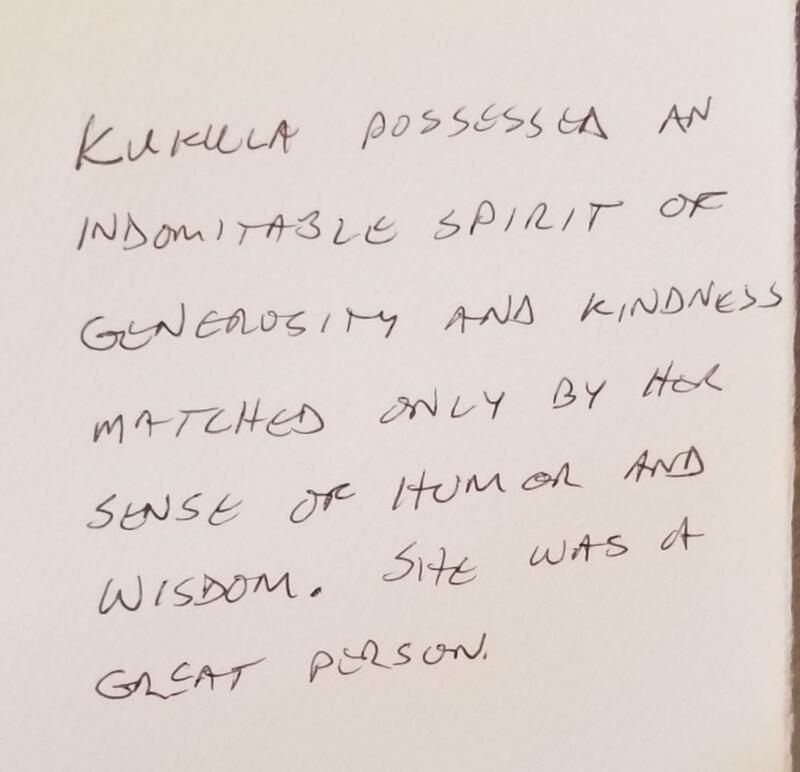 So, even in her passing, Kukula is quietly guiding me toward a lesson to hold tight the people who I truly really appreciate and to make sure I tell them how much they matter to me while I still have the chance. I know this is likely not an email you were expecting to receive today. 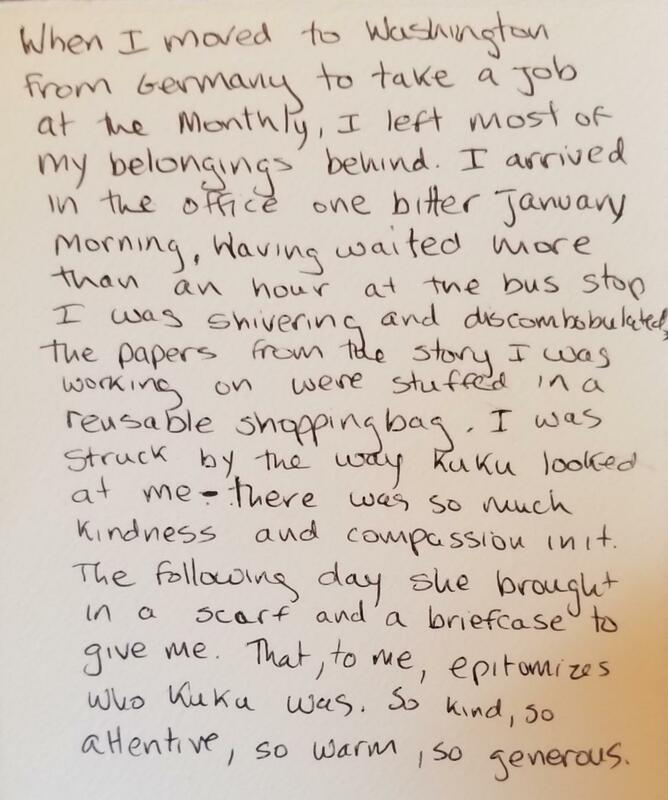 And I am truly sorry if it is inappropriate to share my grief with you, but Kukula was such an incredible woman and I wanted to share with you just what an impact she had on me—the example of how to simply be oneself—be warm and caring, while also sharp and professional—she provided is one I follow daily in my interactions with other people, colleagues, and my family. 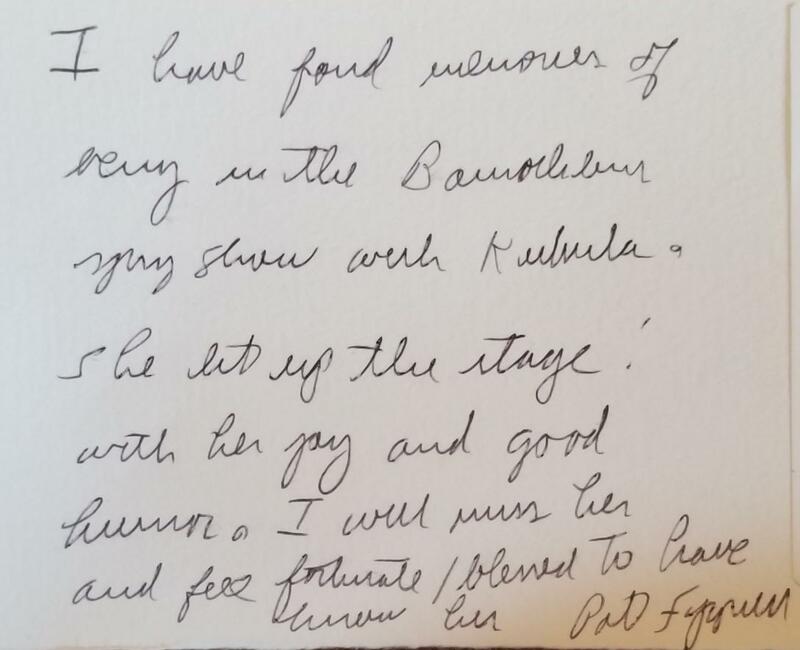 We know that we are joined by the Monthly family in our grief at Kukula’s passing, our gratitude for her remarkable life and for our good fortune in having been part of it, and our admiration for gallant Paul and the way he has endured the unendurable. 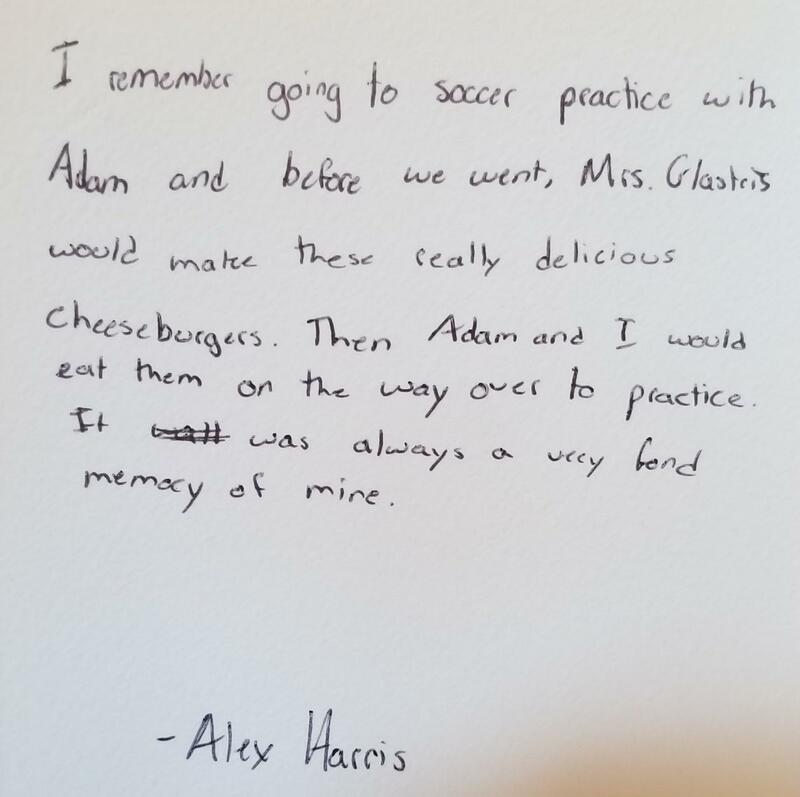 We are thankful that he, Hope and Adam have the support of their wonderful extended family. St. Paul gave us some of the most comforting words in Scripture referring to the life to come when he wrote: "What no eye has seen, what no ear has heard, and what no human mind has conceived" -- the things God has prepared for those who love him.” 1 Cor. 2:9. This week neuroscientists found that our brains mirror a multiple layer of dimensions as exist in world of particle physics—there are other realities and a “life to come” in the “Kingdom not of this world” for those that love God and to love God is to mirror the essence of being made in the image and likeness of God—to emanate love, to be light in spirit, joyful in heart, as innocent as a child yet as sage as an old wise man. 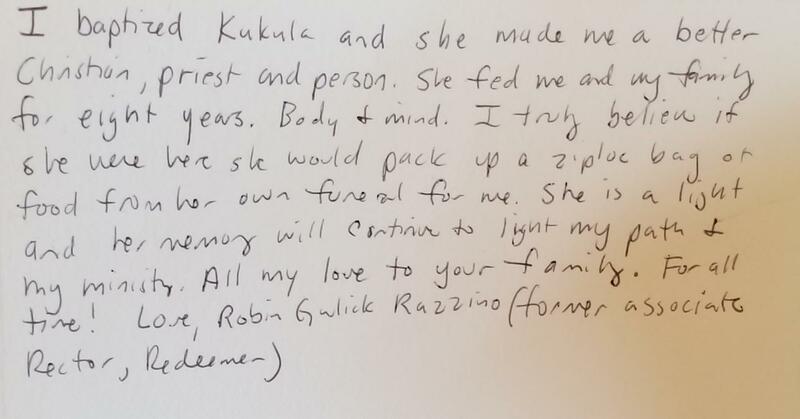 Kuku was the very embodiment and mirror of love—drawing the very best out of each of us that were blessed to have her in our lives. During this incredibly draining ordeal, you taught all of us what it means to be a parent, spouse and best friend—you taught us how to love, reflecting His love. Be comforted my friend in this time of grieving for she was as light as floating feather and her soul can only draw near to its source of light. In the next few days you will witness the love that Kuku drew out of us in the eyes and hearts of those surrounding you—like the single flame just before Easter that lights up the whole Church when it shared—you will see that light which will help you face the pain and loss. We love you Paulie and feel so very Blessed to have you and Kuku be part of our lives. I forwarded her name to several monks to commemorate for 40 Liturgies. 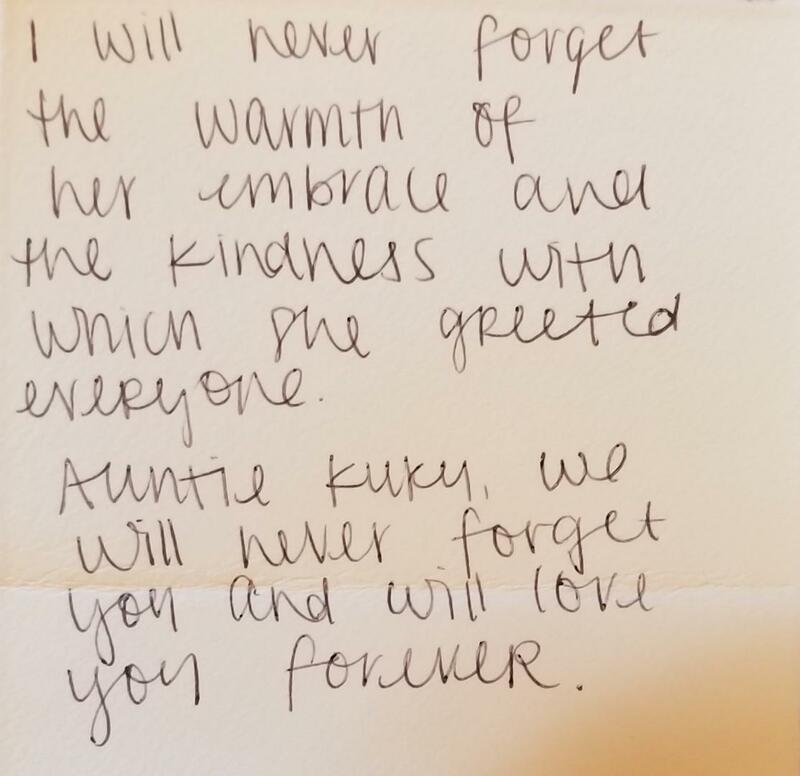 Kuku was so enormously kind and loving - and I'm only trying to think now of how she might wisely counsel us to manage such sharp grief. My heart goes out to Paul, Hope, and Adam. Love to you all. 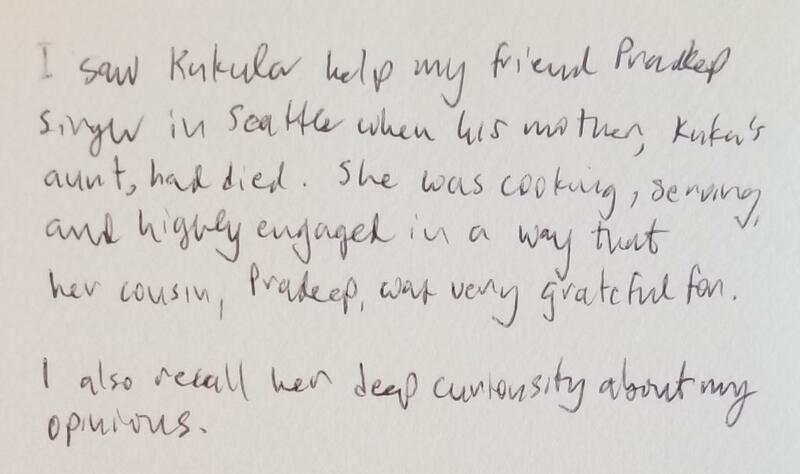 My memories of Kukula are of a wonderful, warm and engaging woman, with an extraordinary range of knowledge, an erudition that was all the more profound for its complete lack of fuss, and a deep and sincere interest even in people who, like me, only occasionally passed through her orbit. I know that the grief one feels at someone's passing is proportional to the joy that the person brought, and can only begin to imagine what you are feeling. 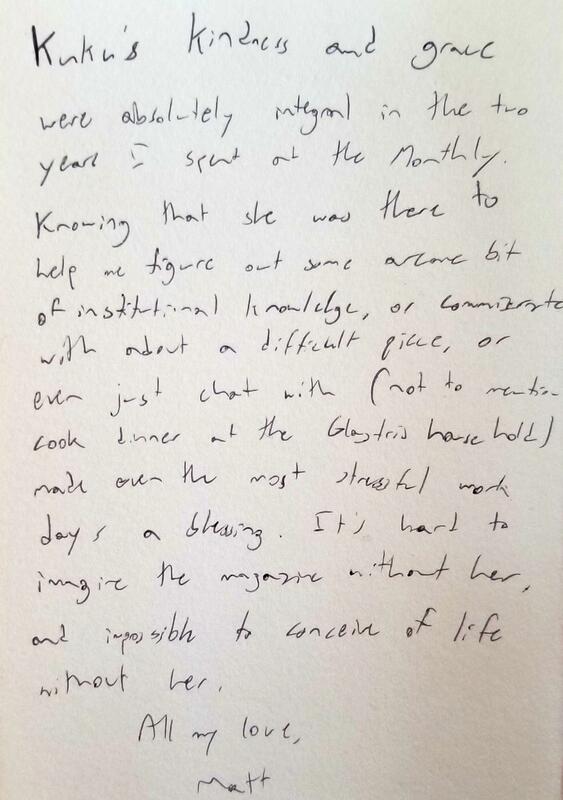 It is poor consolation that other people too know the loss, but she will be very much missed. 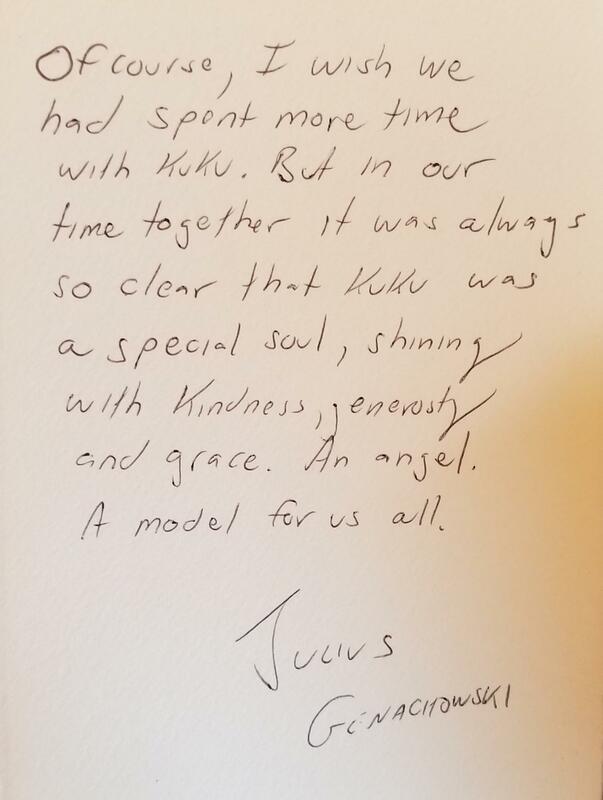 Kuku was such a kind, warm, wonderful person, and she treated the staff like family. 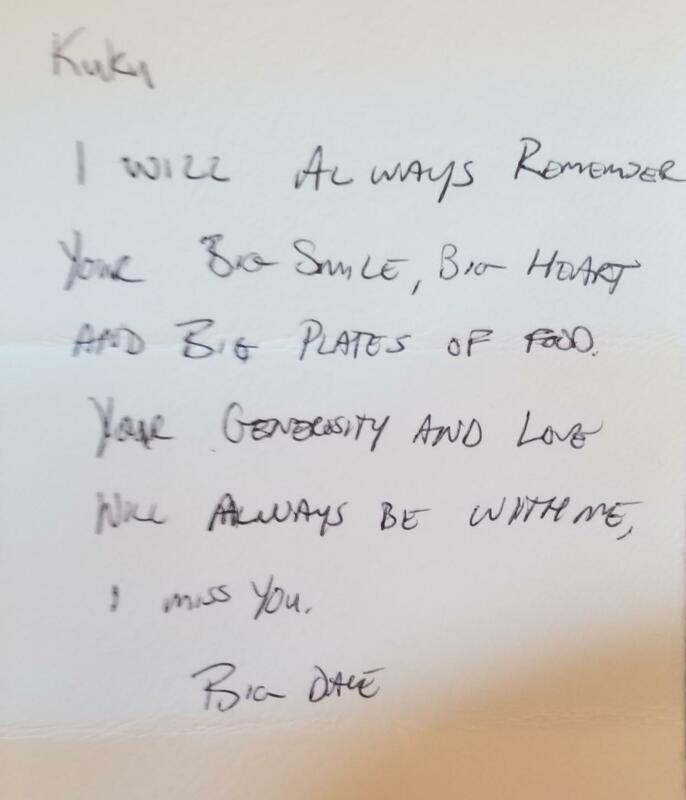 I will never forget the trays of delicious Indian food that she used to bring into the office. 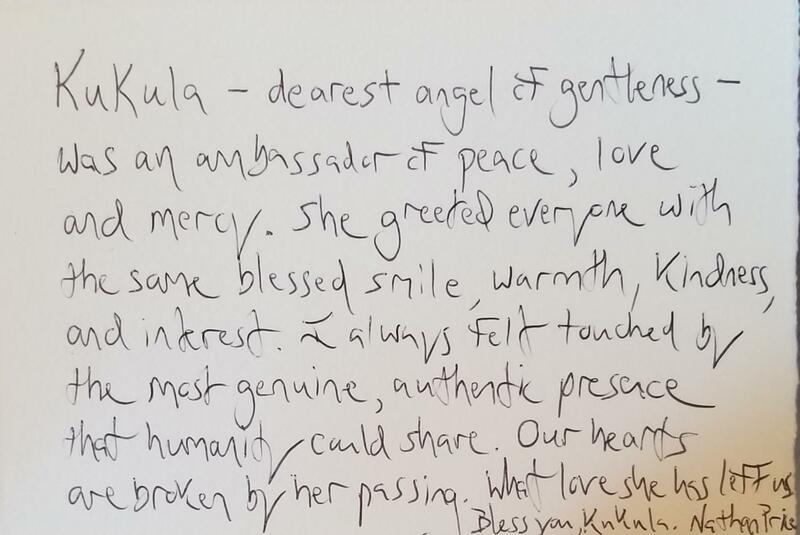 dearest beloved kukula kapoor glastris, my cherished friend and colleague, may you now be in the kind of peace and light and love you brought to everyone who loved you; to say you will be missed is to understate the truth by approximately infinity. rest, darling. rest. She was a magical person, radiant with care and intelligence. May her blessed memory endure forever. 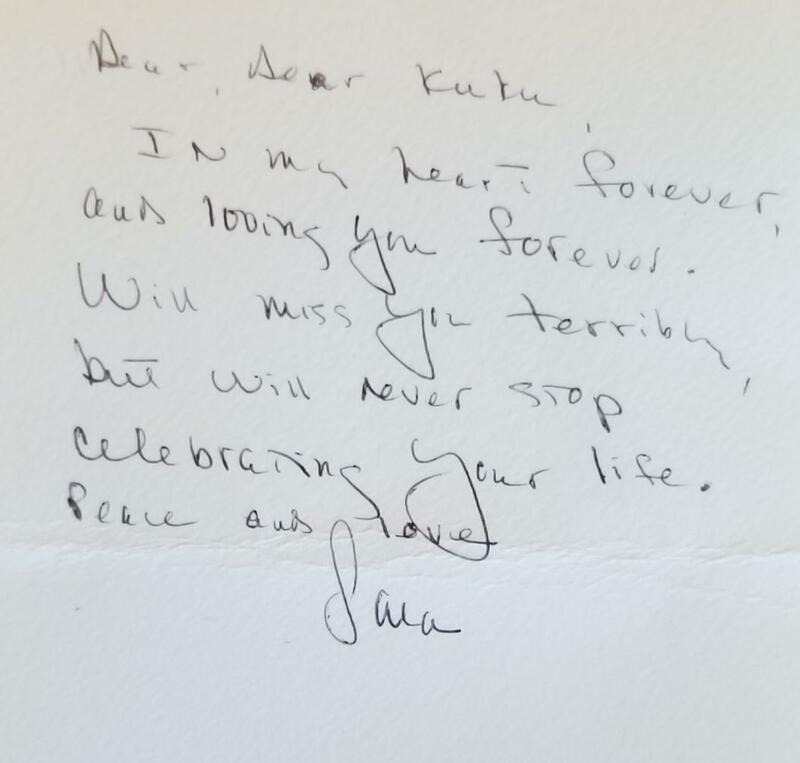 Paul, I recently learned of Kukula's passing from our mutual friend, Ann Sheridan. I hadn't seen Ann in years and it was a delight to catch up with her and reminisce about our time together on the Dukakis Campaign. That was until, she shared the tragic news about Kukula. I was crushed. 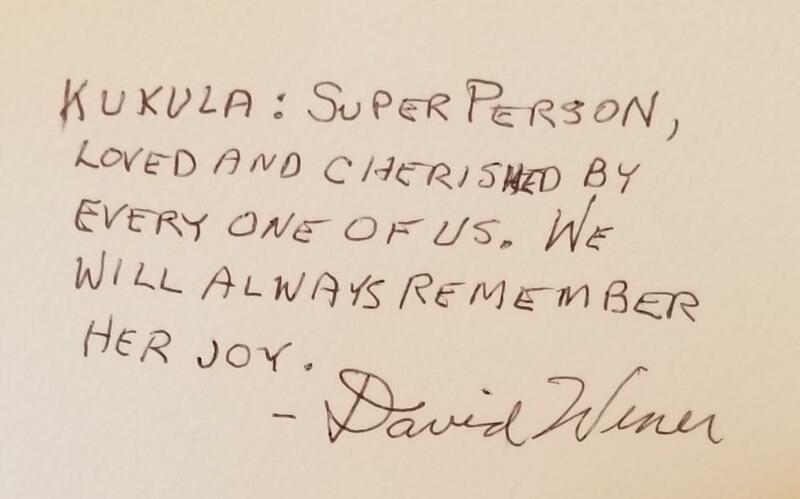 I have very fond memories of working closely with Kukula in the small press office of the Chicago Campaign headquarters. Always relying on her unbelievable talent, good judgement and delightful disposition. I was, and continue to be, a techno dunce, so she rescued me many times in trying to produce anything on the computer. 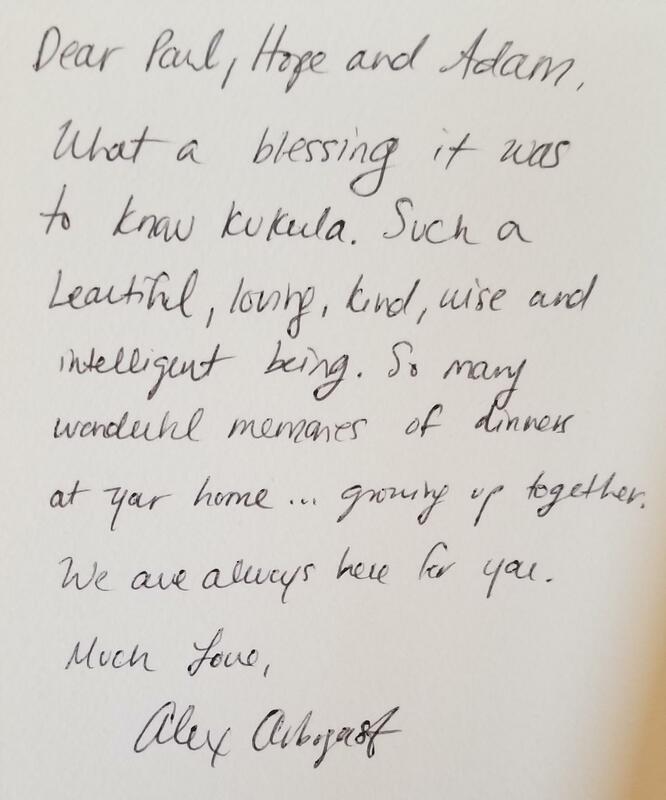 I also fondly remember joining the two of you in your Chicago apartment for one of Kukula's wonderful home-cooked meals. What a treat after eating out of paper bags during campaign season. 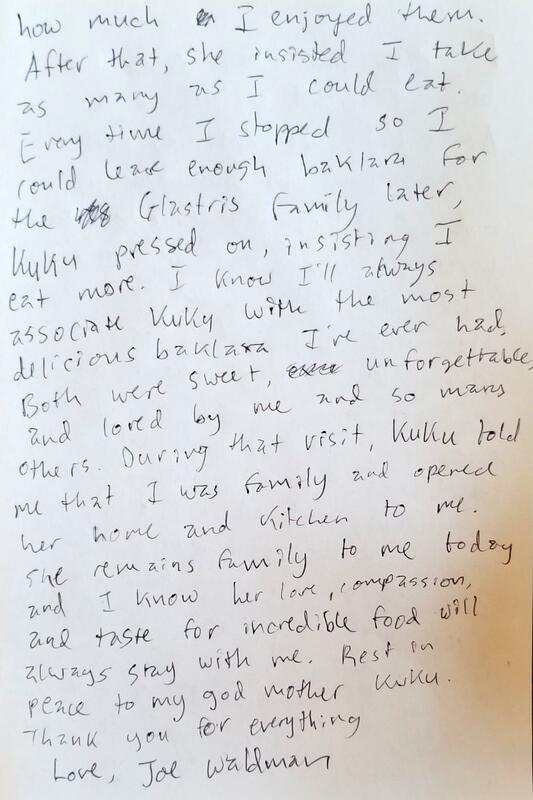 I loved seeing pictures of your two beautiful children and the many fabulous photos of Kukula. 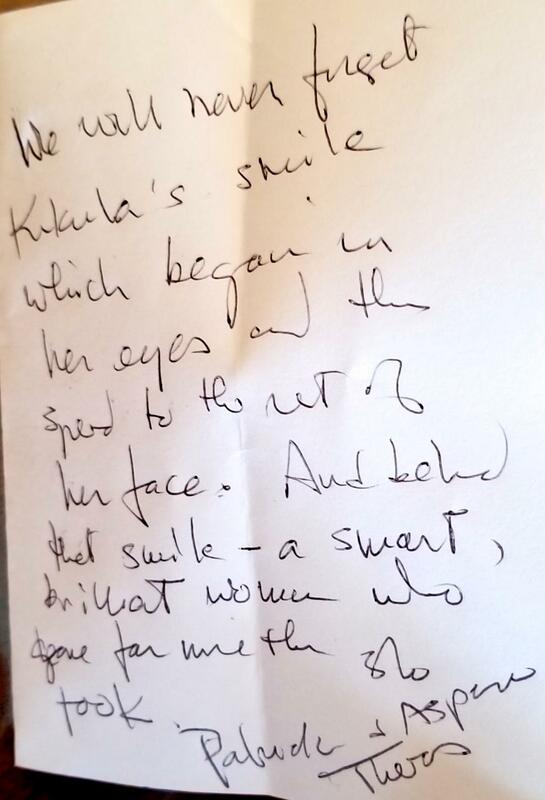 I will treasure my memories of working with Kukula and her beautiful smile. You and your kids will remain in my thoughts and prayers. 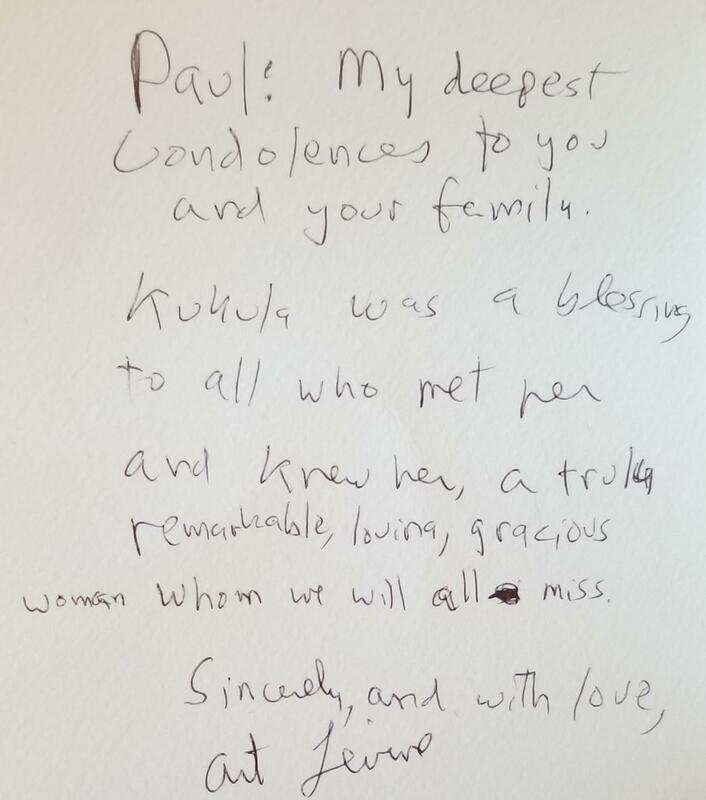 I have just learned of Kuku's passing, and am deeply saddened. 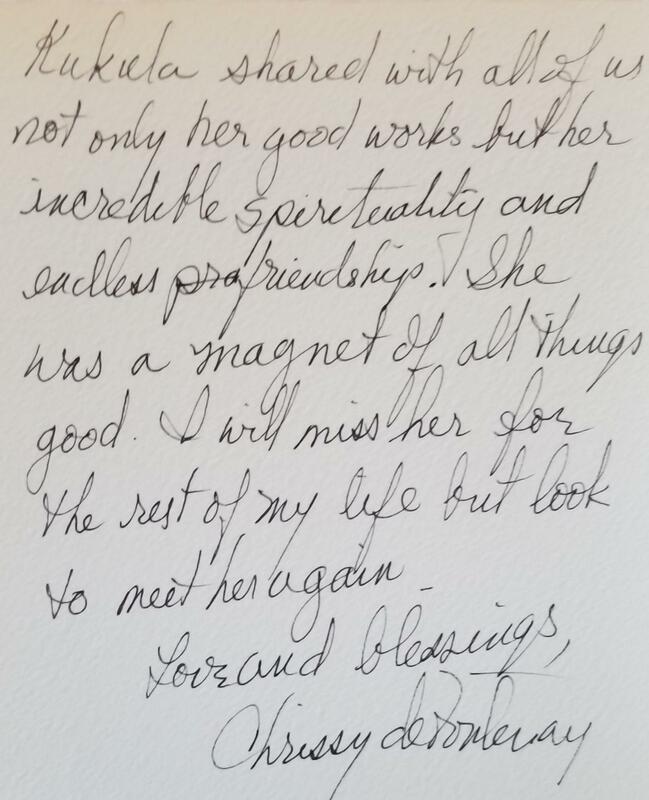 I knew her through her cousin, my best friend Pradeep Singh, and was always struck by her warmth and kindness. 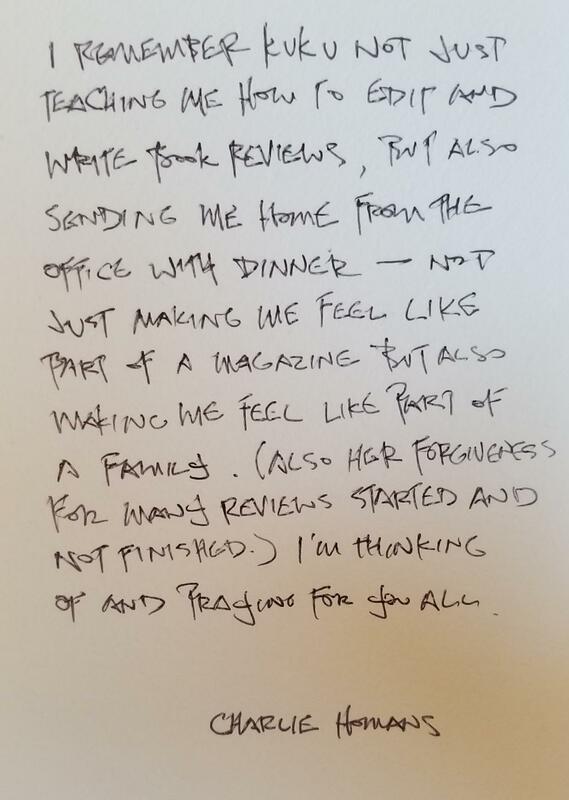 Now, in that tragically paradoxical way of obituaries and eulogies, I feel know her much better, and am so impressed by what she did with her life, and how many people she touched. May her memory be a blessing upon us all. 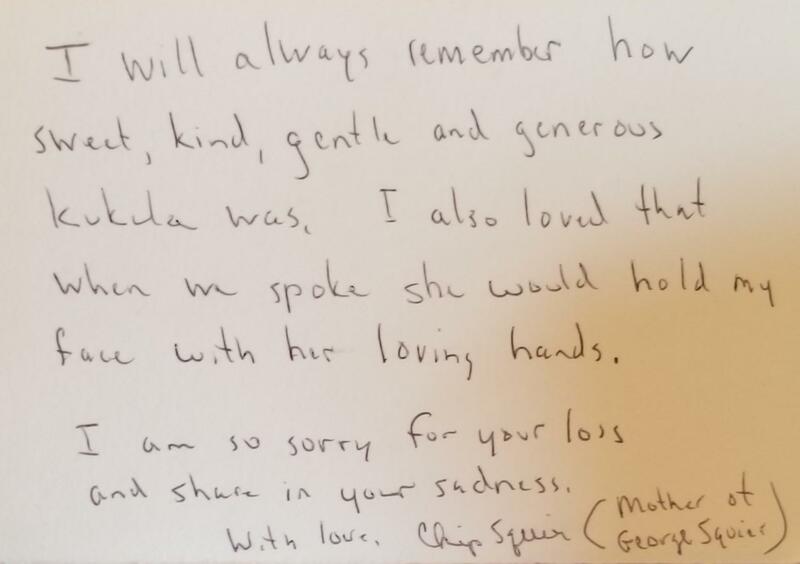 I wanted to share with you an email that I wrote to Hope and Paul about my Kuku, who as you can see via the below correspondence, I always referred to as "Mama", or "my Greek Mama", though she was formally saved in my iPhone as "Greek Mommy". For those of you who I haven't yet met (I hope to meet you soon! ), I am (self-proclaiming myself as!) Hope's best friend from college. It is hard to find the words to say during such an unintelligibly devastating and difficult time. For example, "difficult" is an excruciating understatement of a mere word, which is why I have decided to write from the heart this morning with simple uncomplicated terms or expressions. 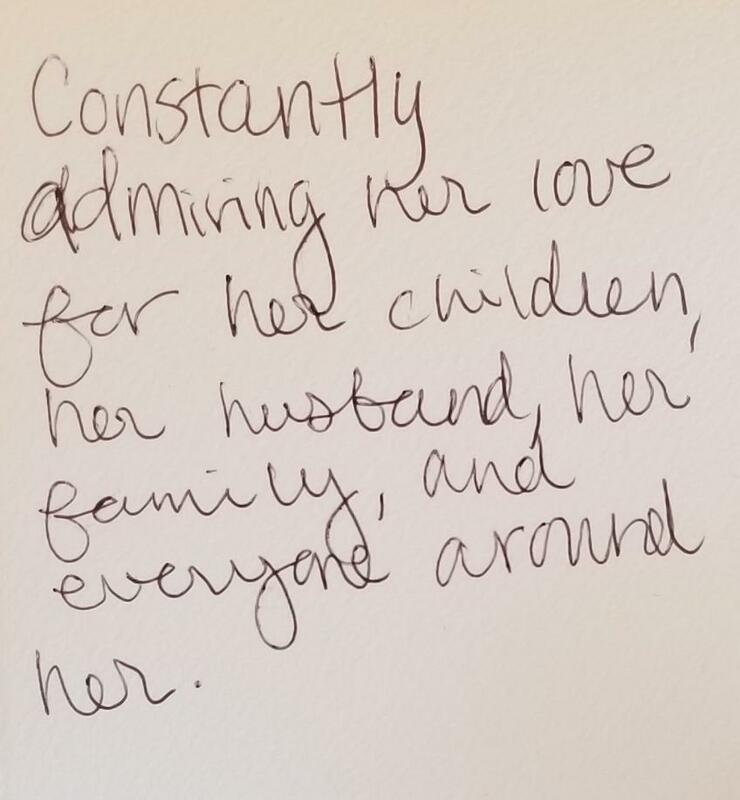 I am writing today with an extremely heavy heart, but one that is full of an absolute over-abundance of love and gratitude for the woman that helped shape me into the person I am today. I have been listening on repeat to Mama and I's favourite Fleet Foxes song, "White Winter Hymnal", which will always remind me of the snowy mornings I rode into work with her. During these drives, we would regularly comment on how lucky we were to have each other, as well as how fortunate we were that our families were so close; despite the fact that they still hadn't known each other for as long as it seemed they had. We would pass Embassy Row and comment on how much we loved DC, which would then prompt a discussion about how happy the two of us were that I had decided to move from Boston. 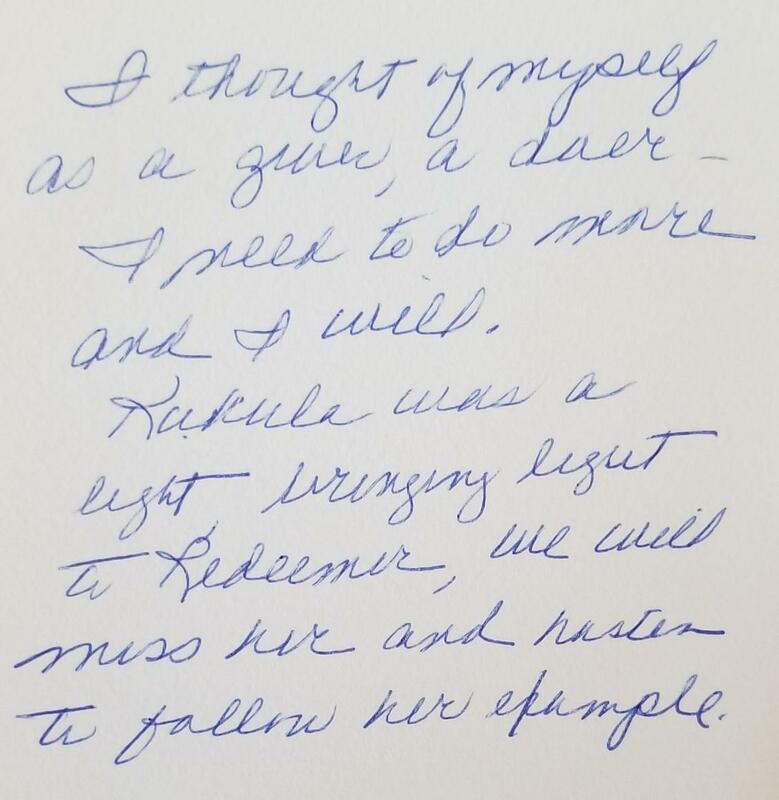 Kuku and I were always giggling and gushing over the things that we appreciated and loved about one another, as well as about our beloved "Greek" family. And oh Lord did we talk about how much we loved Hopie. We schemed daily on how we could get her back with us in the District! 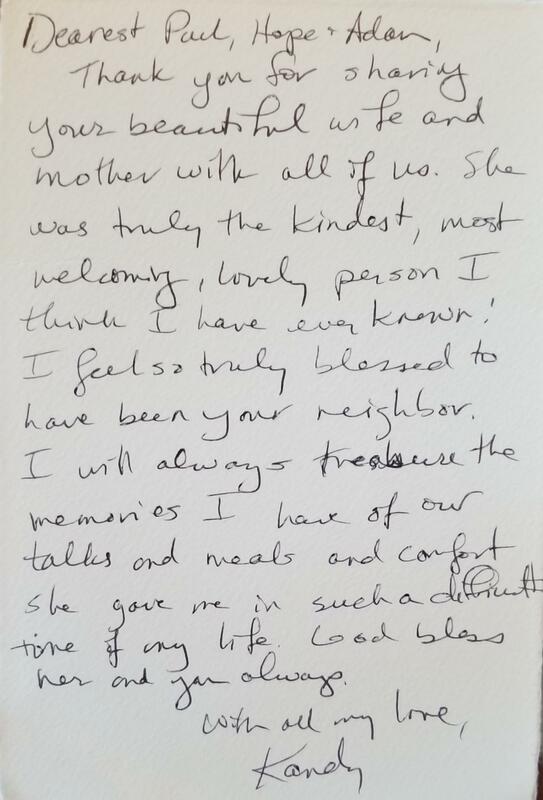 Mama taught me so many things simply by means of her (signature) selfless example. The thought that I am the 73867845738 person to comment on the fact that she is the kindest, most loving, sweetest and most gentle human being that I have come to know, is a massive testament to her character. 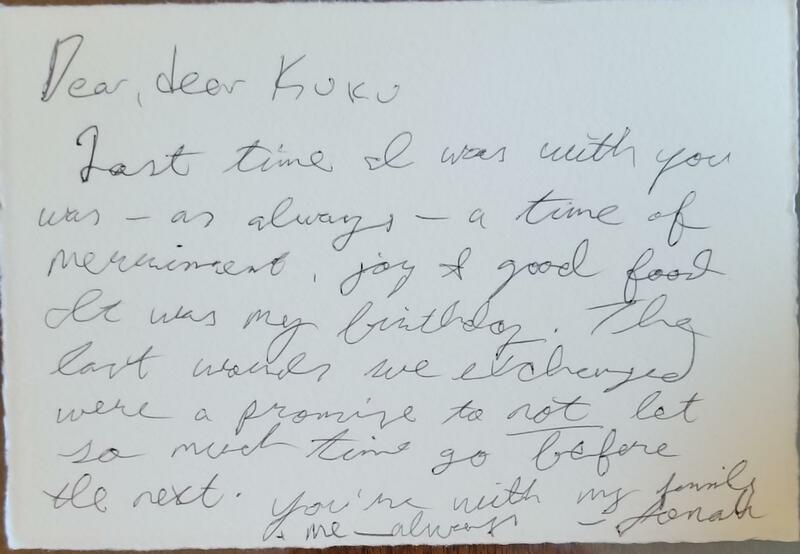 I told Hope recently (and will eternally agree) that there is not a soul on this earth who has ever made me feel as warm and special as Kuku did. That tiny and powerful woman had a way of hugging that genuinely made the world stop. Her embrace always immediately put me at ease, and when I was in it, everything felt right. 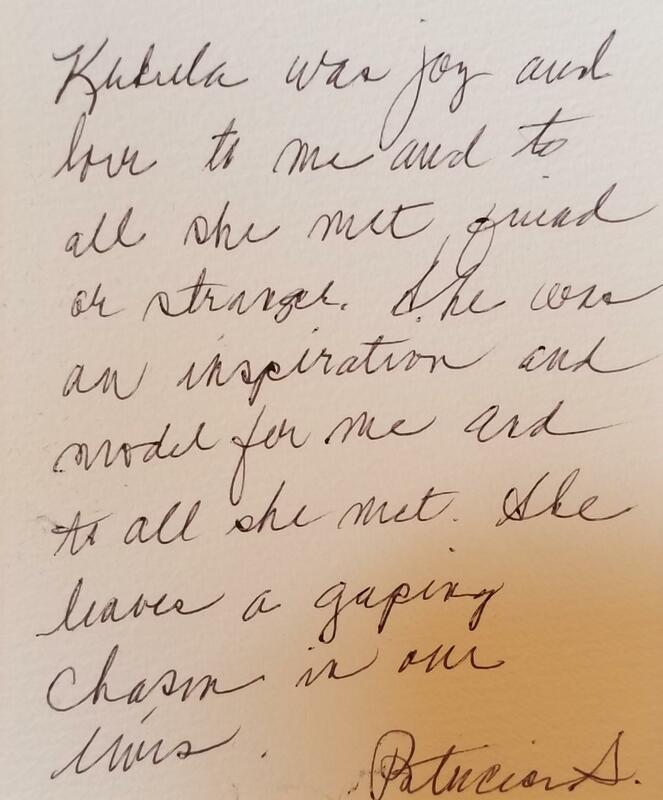 Being in her company also always inspired feelings of gratitude and contentment within me. She had a way of making me recount all of my blessings, as well as gently nudging me to find the beauty in everything. 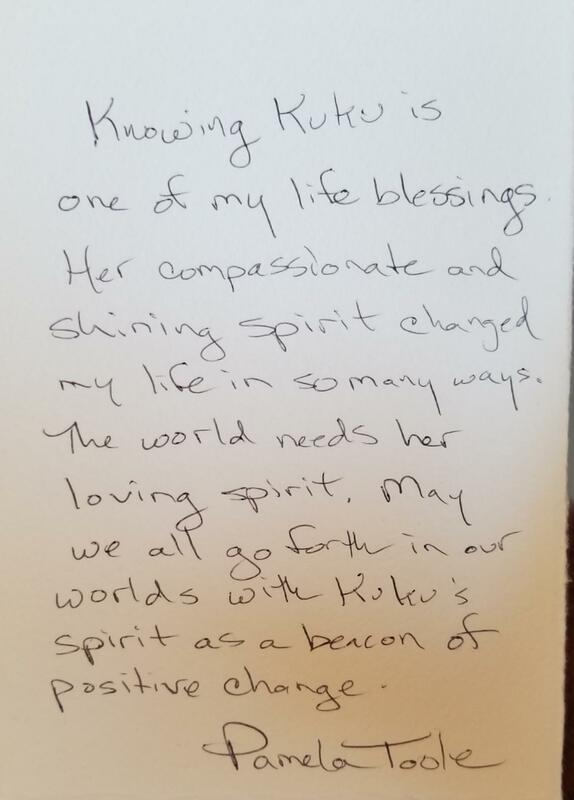 Kuku is an absolute radiant beam of light who means and represents to me everything that is kind and maternal, patient and wise, resilient and brave, and incredibly special in this universe. 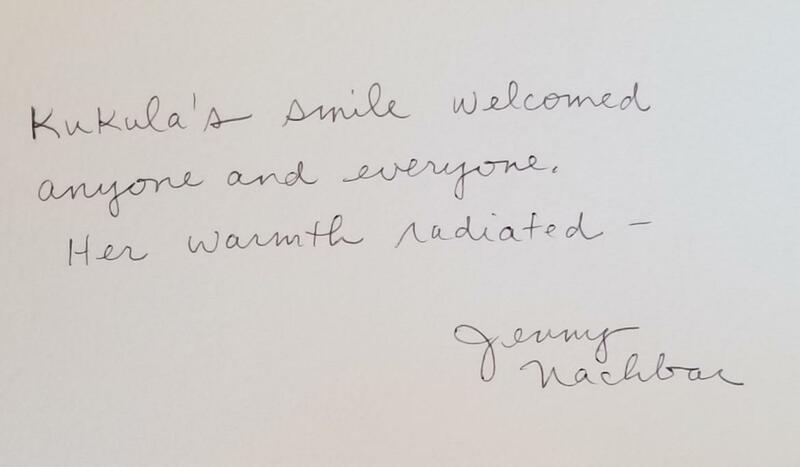 She possessed an ability to unknowingly generate joy and positivity to all of those within her presence. 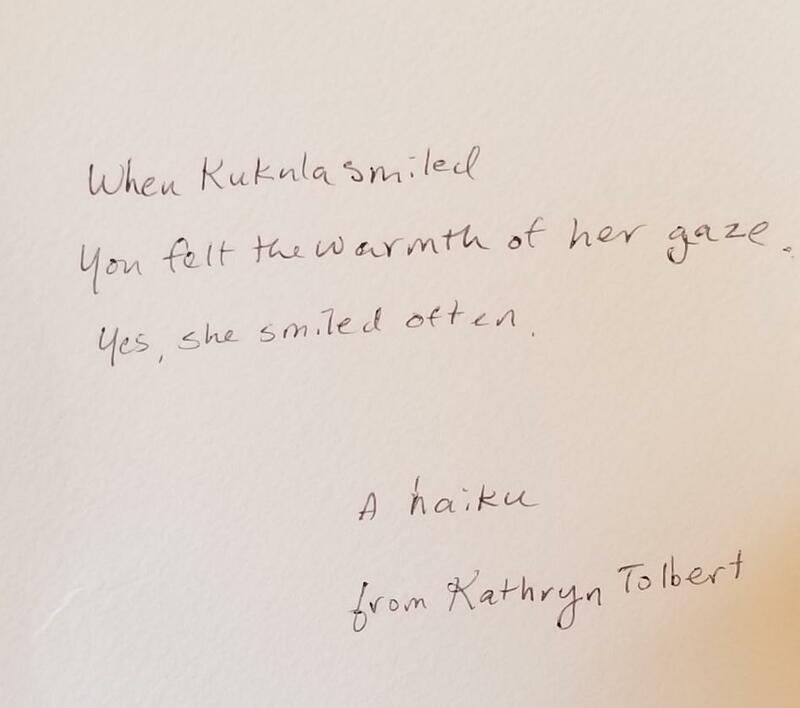 And simply by way of that beautiful and warm smile of hers. 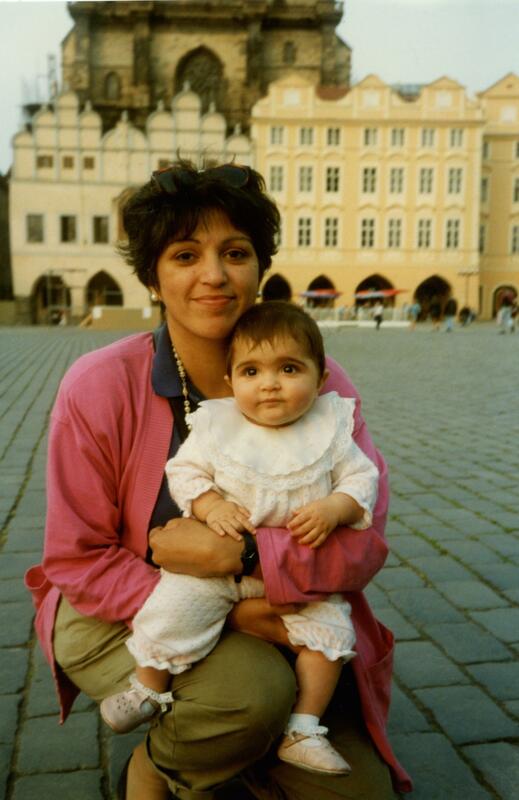 I would not be half the woman that I am today without her guidance. 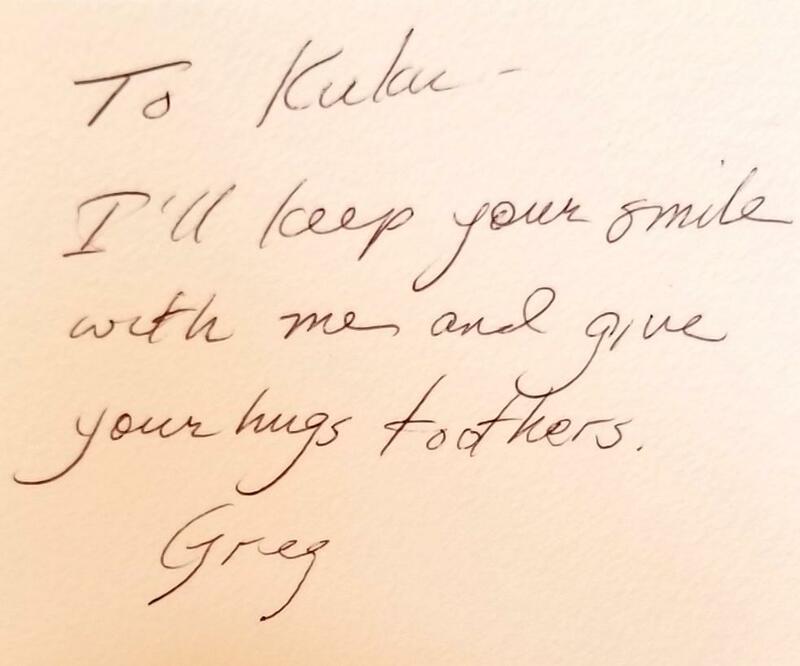 I have spent my morning recounting all of my favourite memories with her while consciously wearing grey (a calculated decision in lieu of wearing black) in her honor. I remember I was attending a friends' wedding in DC once and had stayed over with Kuku so that she could help me get ready the next morning. I was feeling self-conscious because my dress was too informal and seemingly mundane in its drab grey color. When I walked downstairs to show her, her face lit up. "Oh honey, you must be the only girl in the world who can pull off a shade of grey like that! You have so much color in your personality that it suits you enormously! You will absolutely be the life of that wedding!" I remember laughing because she clearly knew me so throughly that she preemptively knew I would regret choosing that color in particular. That's Mama for you. She makes you feel good. 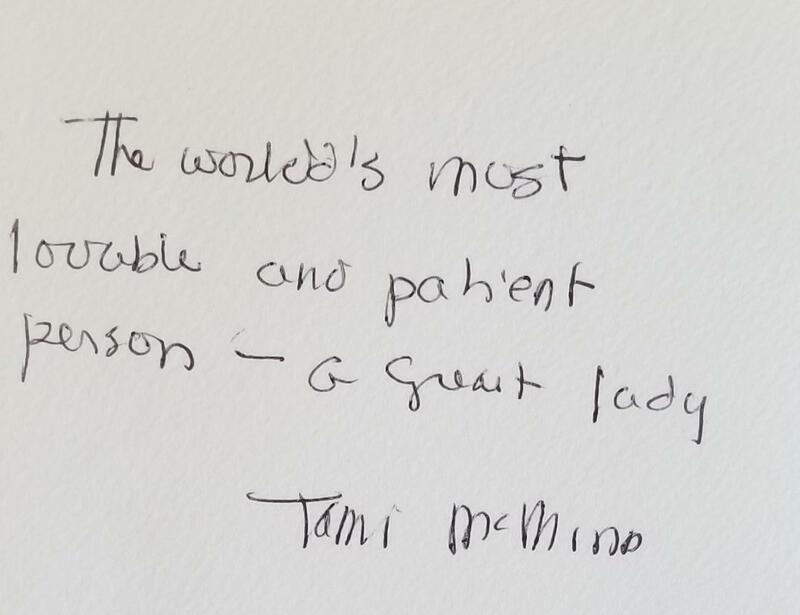 And she sees the good in all of us. And that's why I will be sporting this color all damn day long in her memory. 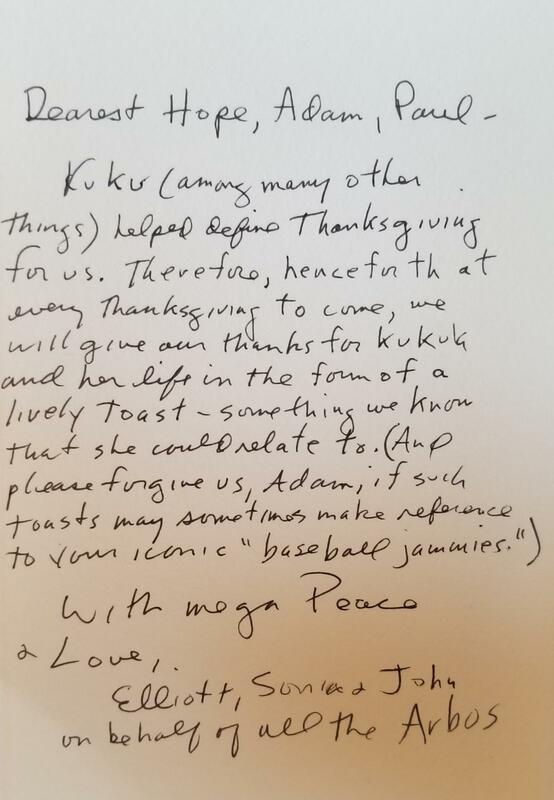 In conclusion, I will never take for granted the enormous blessing that I was afforded in knowing Kuku. To know her is to know true joy and radiance. It is to know happiness in its purest element. And for that, I feel eternally appreciative and endlessly JOYFUL. She will be in my heart every single day of my life from here on out. Kuku, thank you for showing me everything I know through your graceful composure, compassion for others, steadfast thoughtfulness and admirable selflessness, and Joie de vivr! I will see you guys this month to hug you and to love you and to spend time with you. That mere thought of being with you soon is what is getting me through everything at the moment. I love you more than I can ever explain.